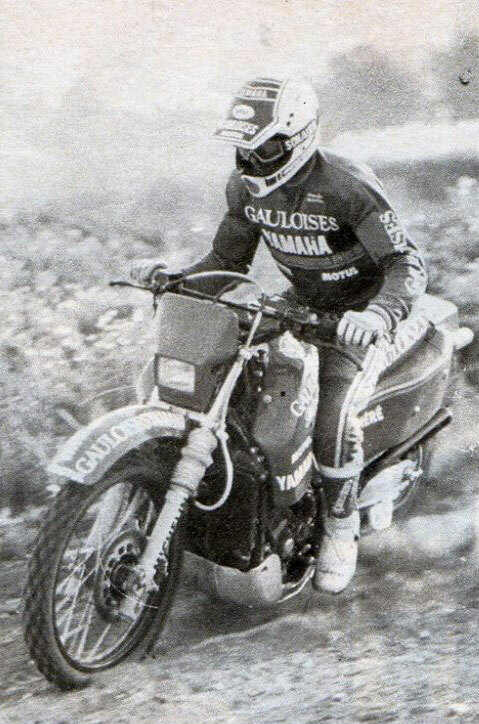 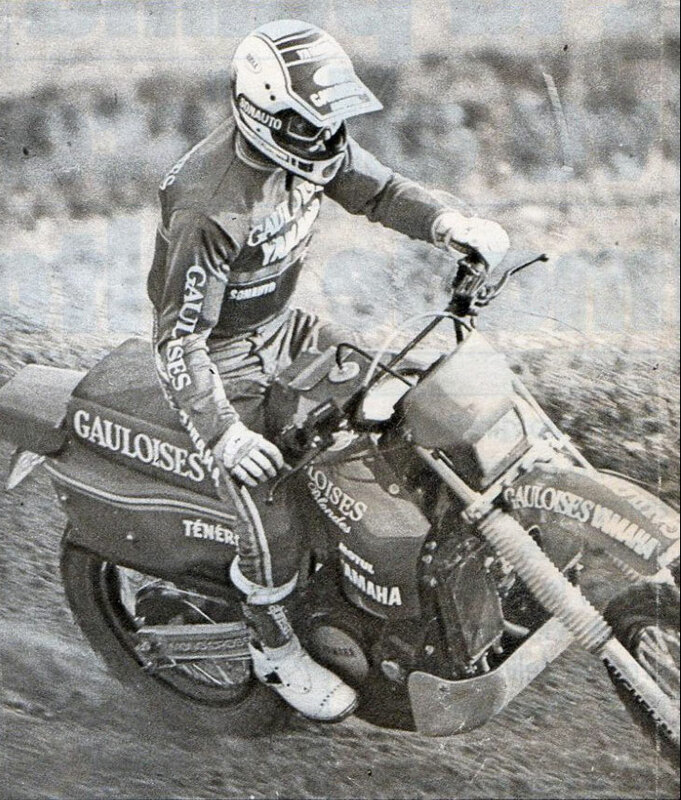 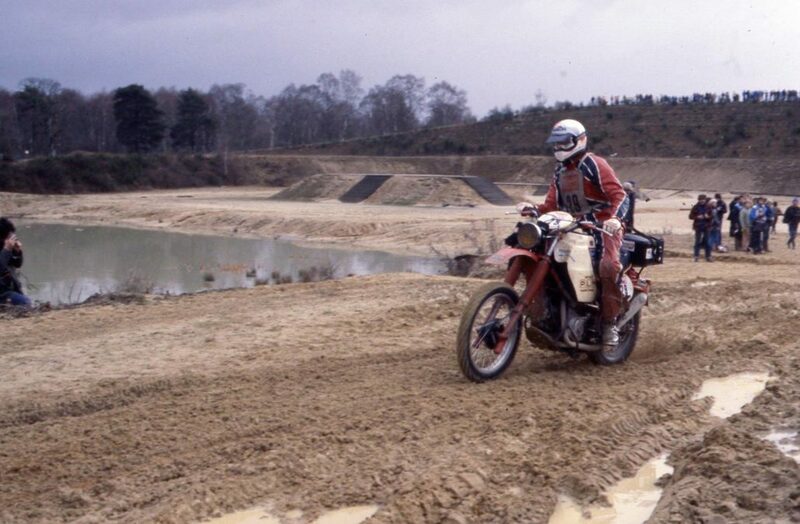 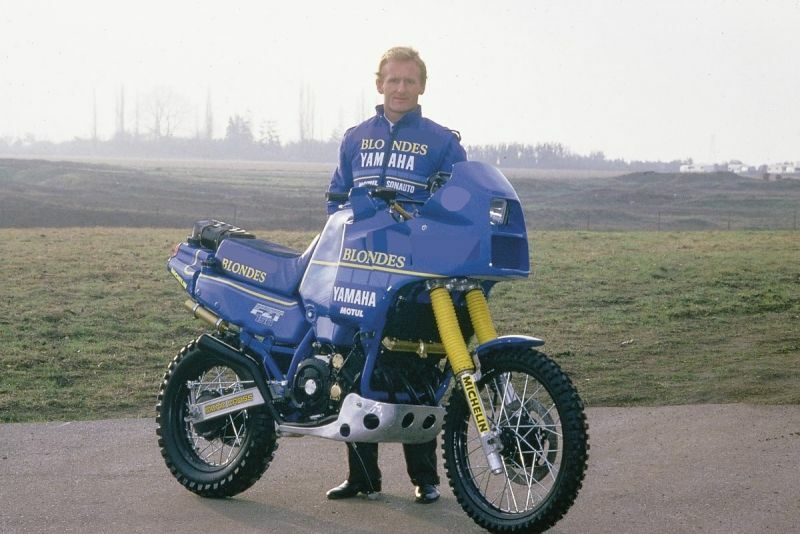 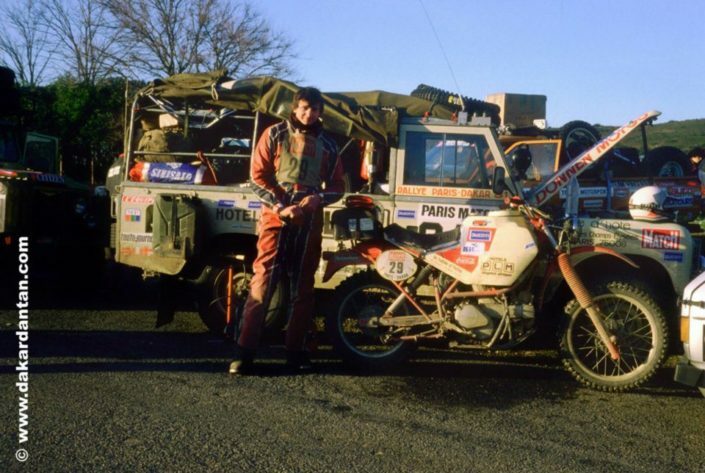 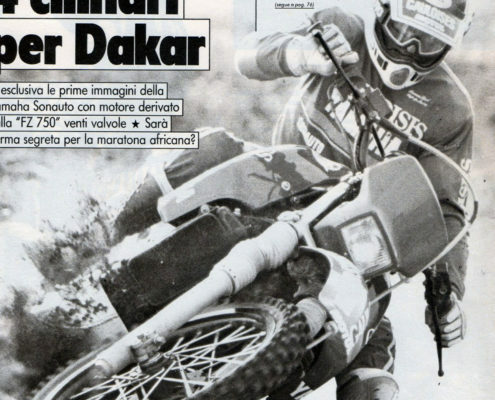 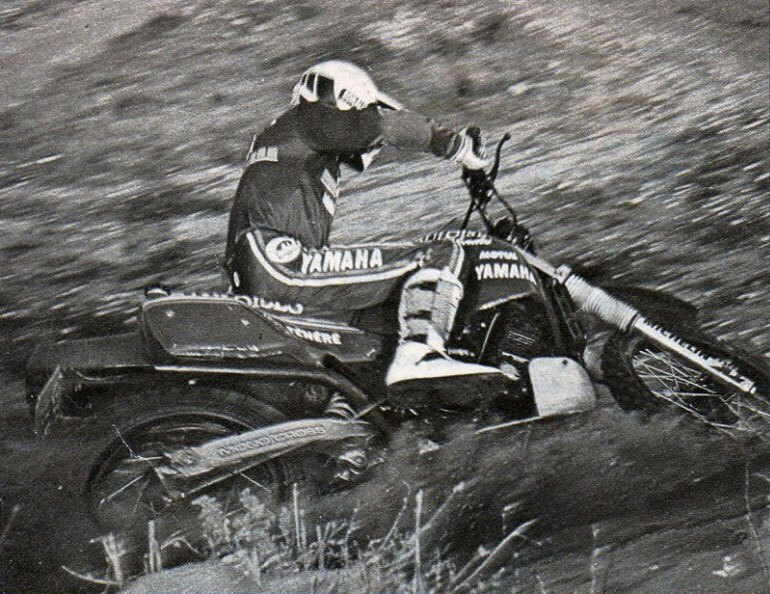 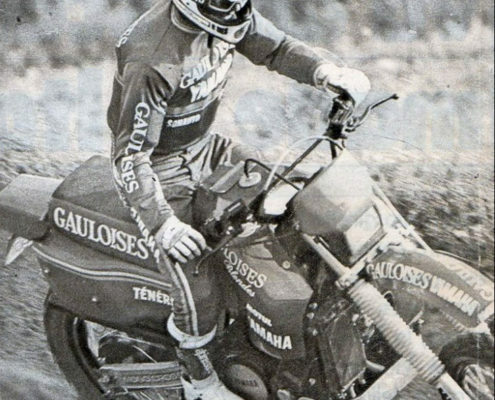 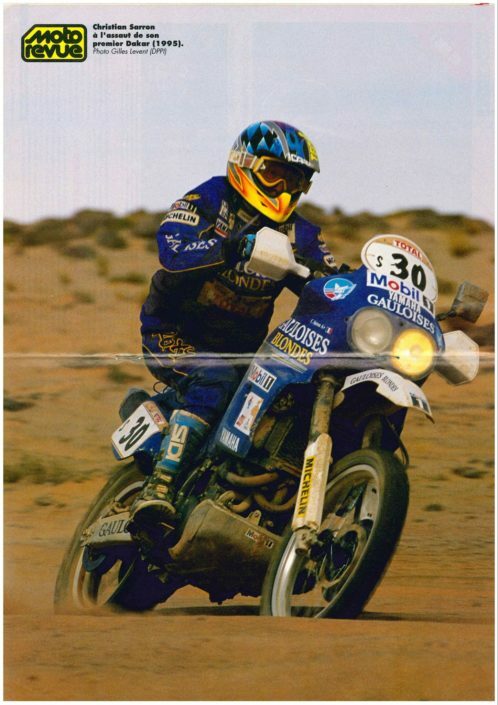 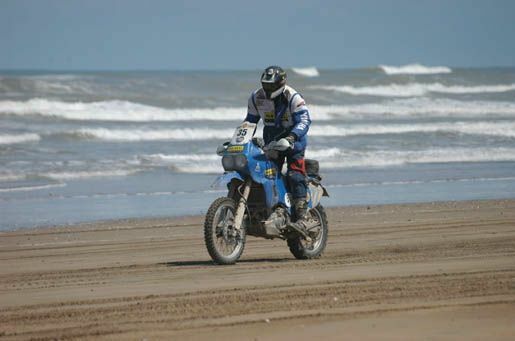 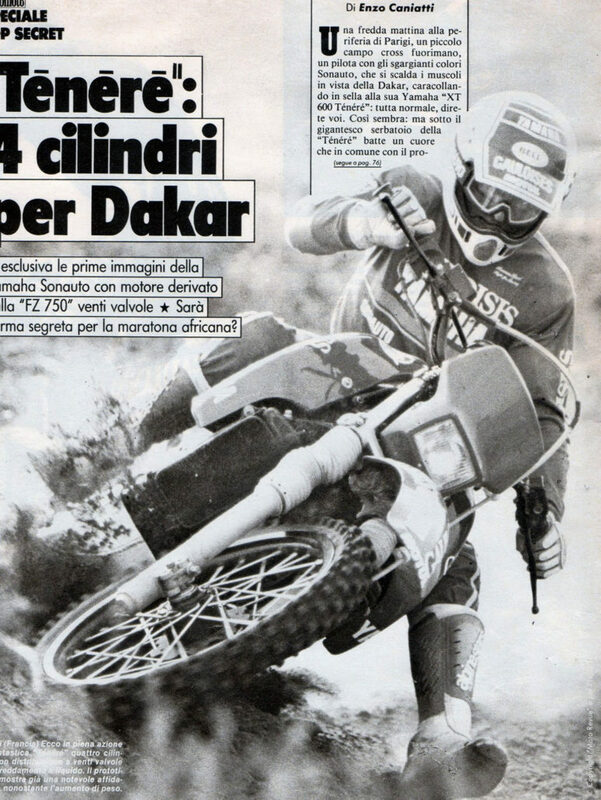 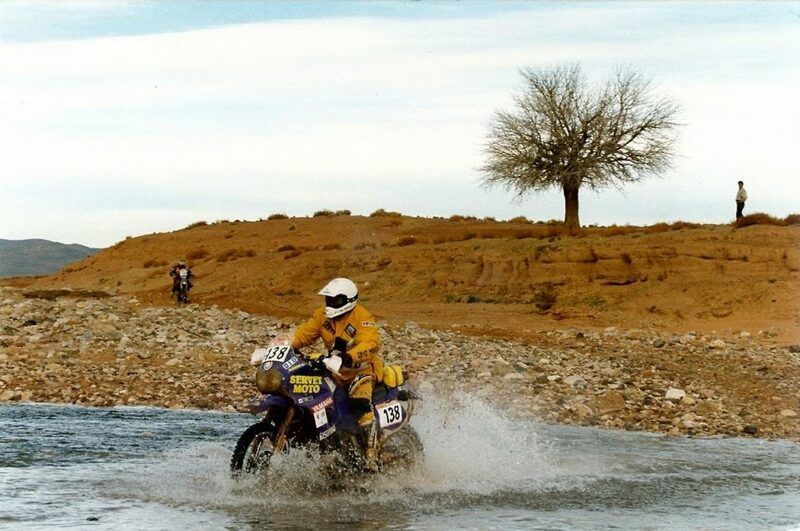 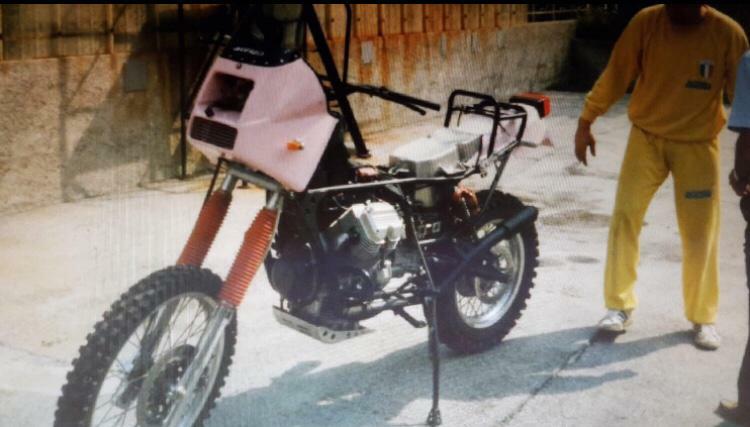 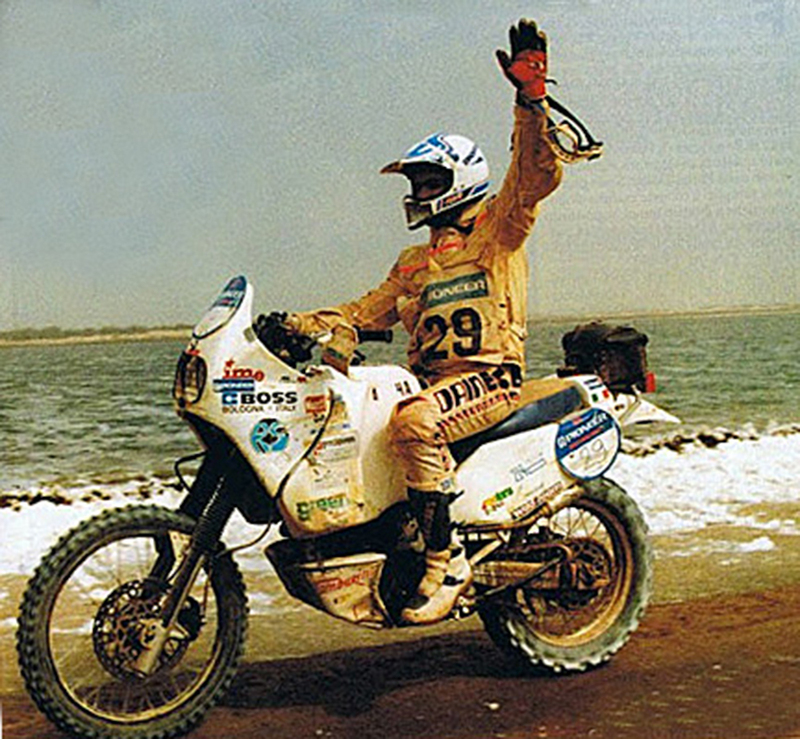 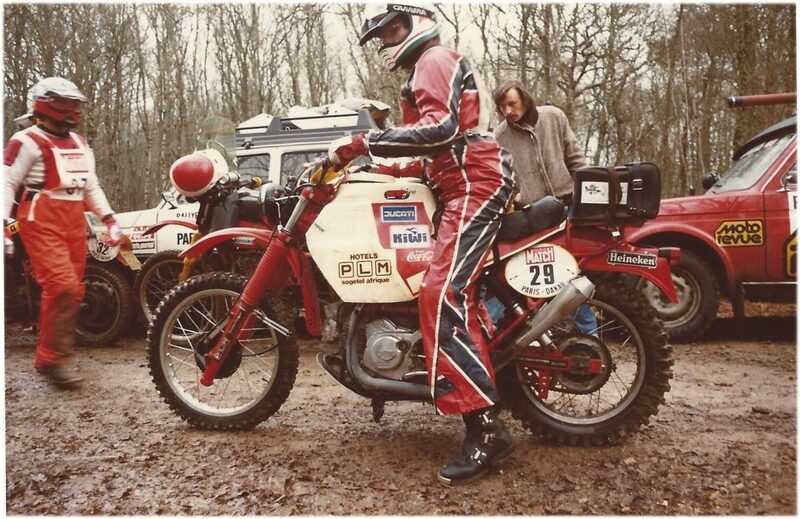 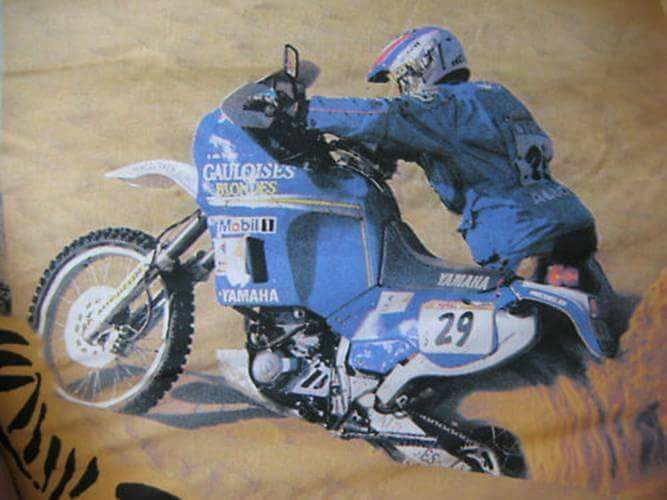 Returning from the ill-fated Dakar 1986, finished with a retired due to a problem with the swingarm of his Moto Guzzi, Claudio Towers do not lose d & #8217; soul and arranges for a new adventure. 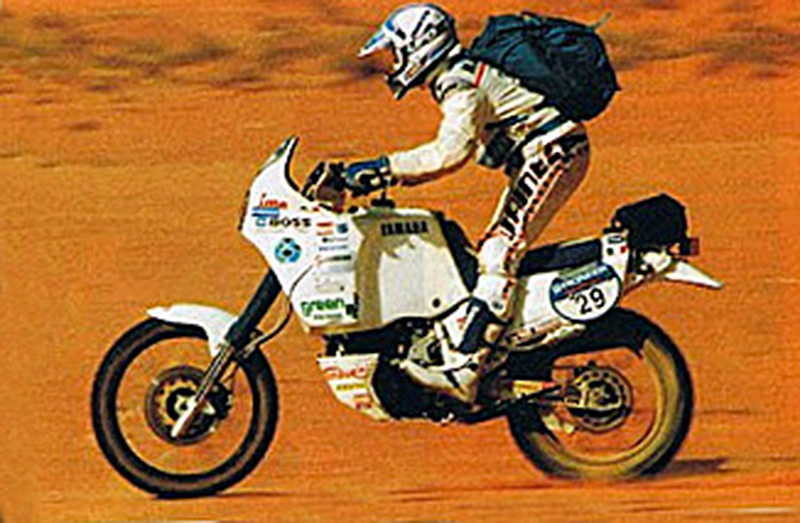 The bike is updated with a headlight fairing aerodynamically, as tendency in those years, fully painted and entered in the following year's Australia Safari. 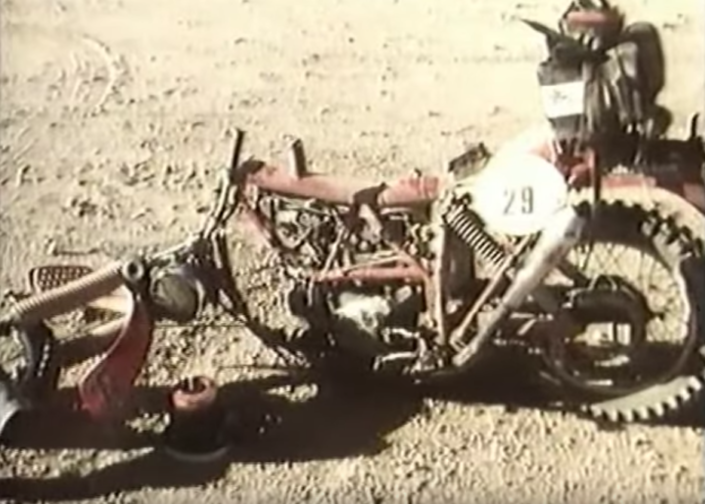 Unfortunately l & #8217; Southern experience did not have much luck, culminated with a retreat because traffic accident with a pickup that caused the fracture of the pelvis of the poor Towers. 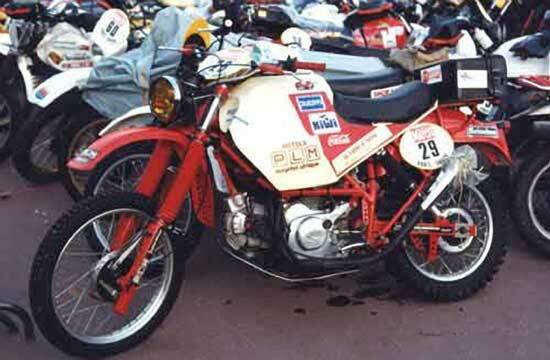 The amazing Ducati P.L. 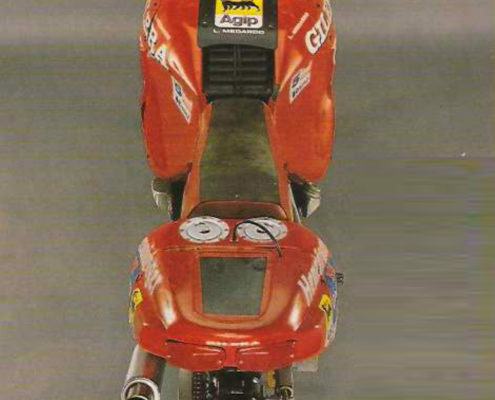 M. by Xavier Baldet, realized on basis Ducati Pantah led to 52 HP, 150 kg for a maximum speed of 180 kmh. 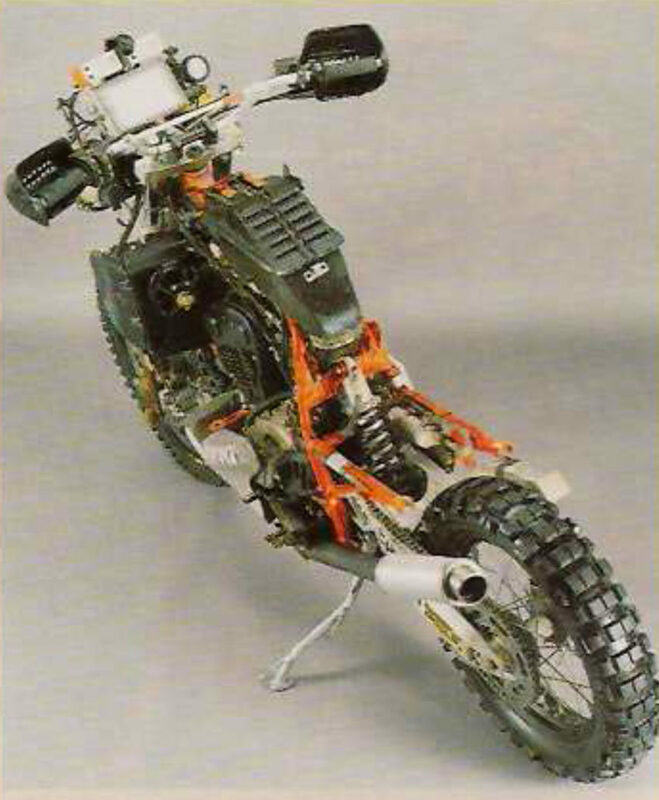 Tubular trellis frame was custom-designed for the realization of this model. 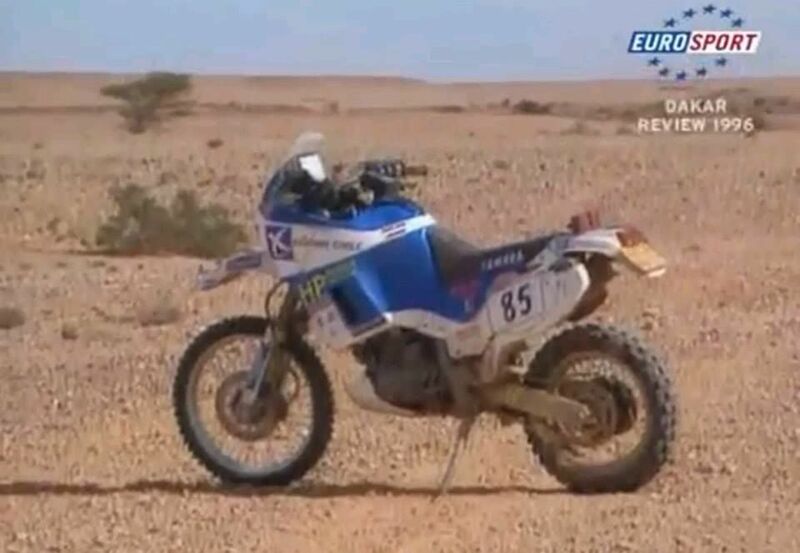 Ironically it was the failure of the frame causing the withdrawal of Baldet. Below a video excerpt which testifies to the disastrous retreat of Baldet. Forks: Marzocchi 38 PA advanced axle excursion 300 mm. Shock absorbers: double wishbone excursion 230 mm. 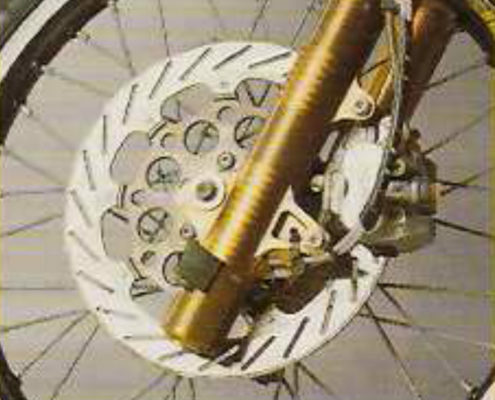 Brakes: drum, front from 160 mm rear 150 mm. 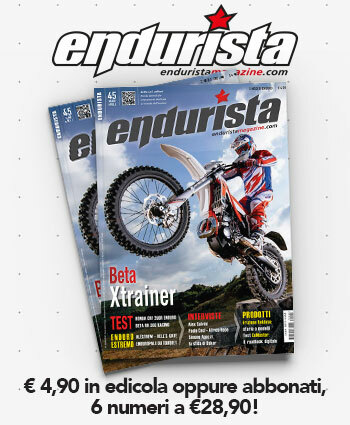 After several articles devoted to road bikes or racing, This time we're back speaking of offroad extreme, because the protagonist is the Queen of this kind of races, i.e. 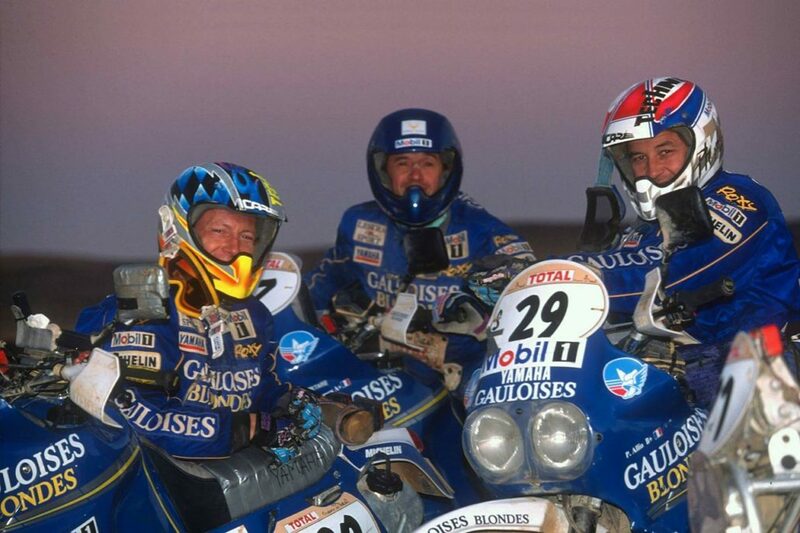 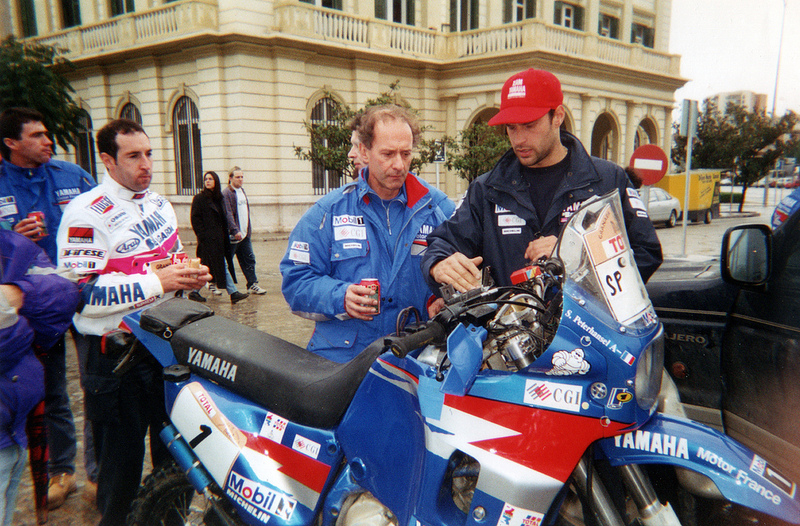 the Paris-Dakar. 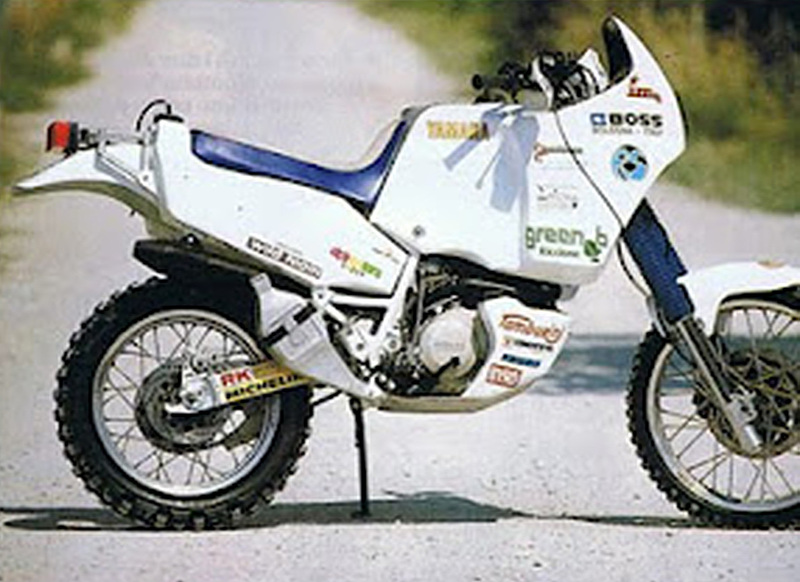 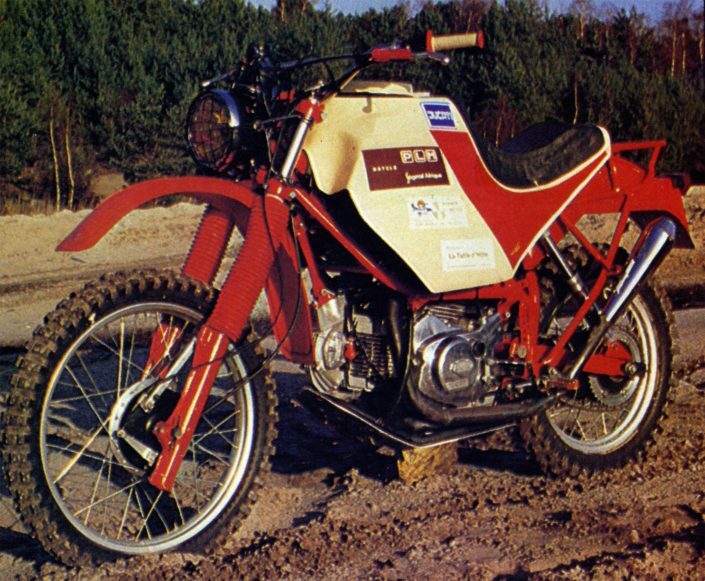 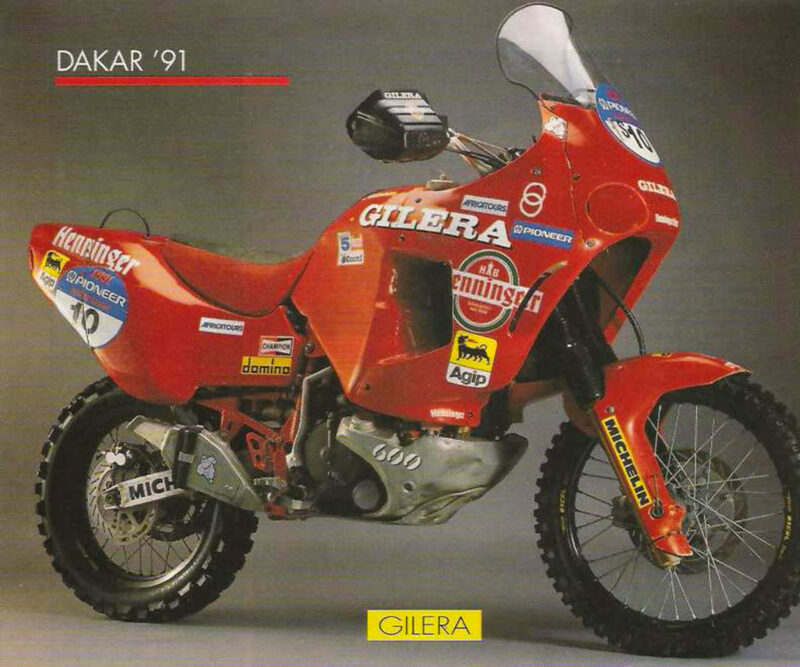 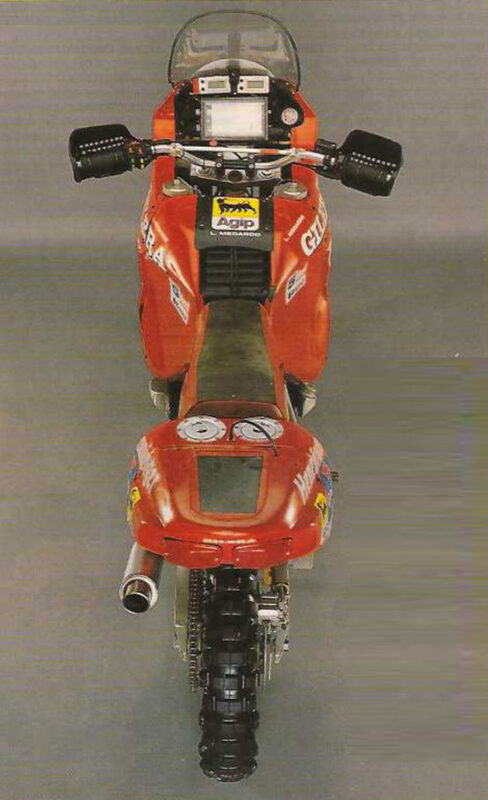 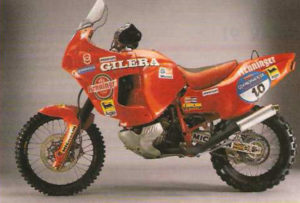 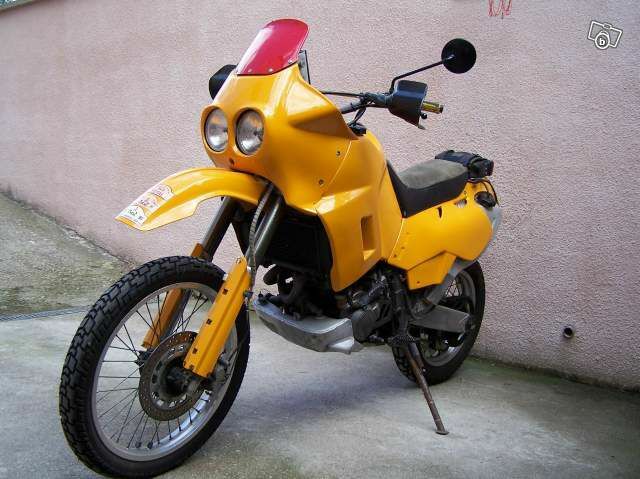 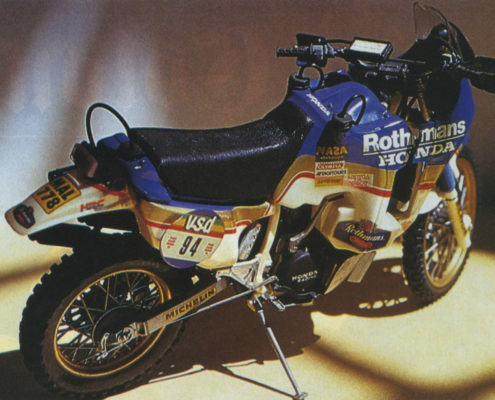 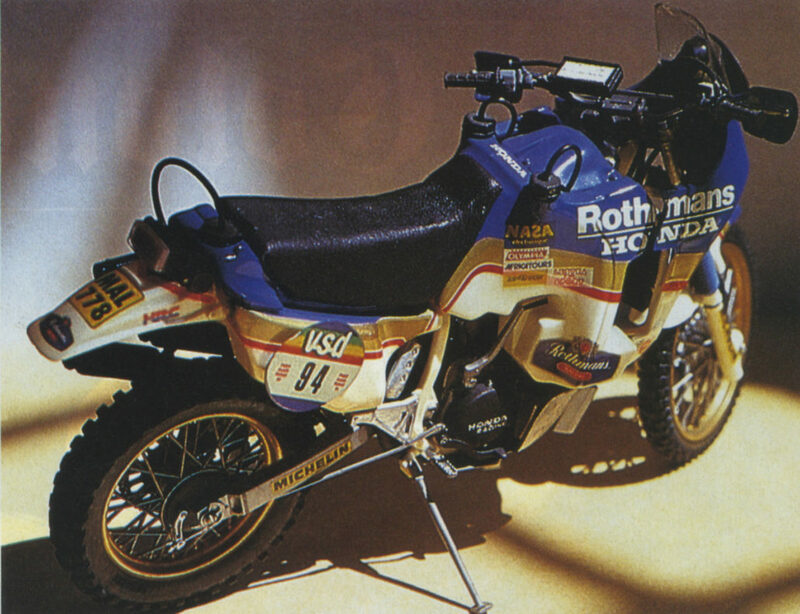 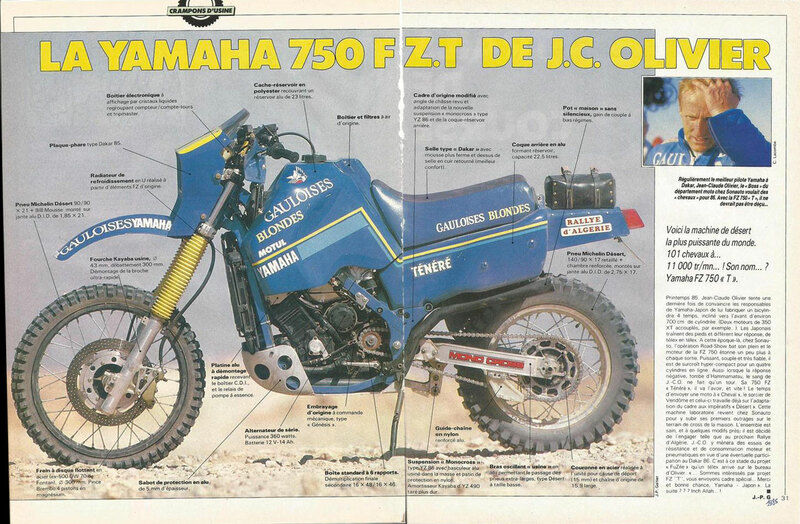 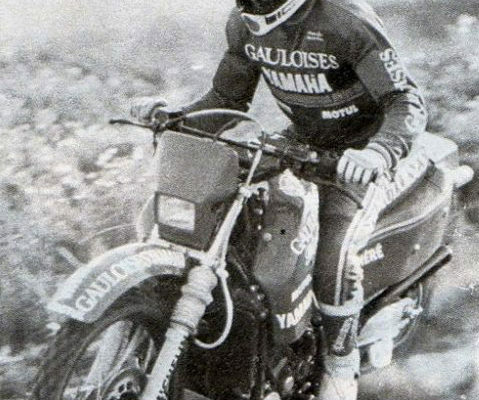 The model under consideration is the Honda NXR 750, African Marathon winner 1986 with Frenchman Cyril Neveu. 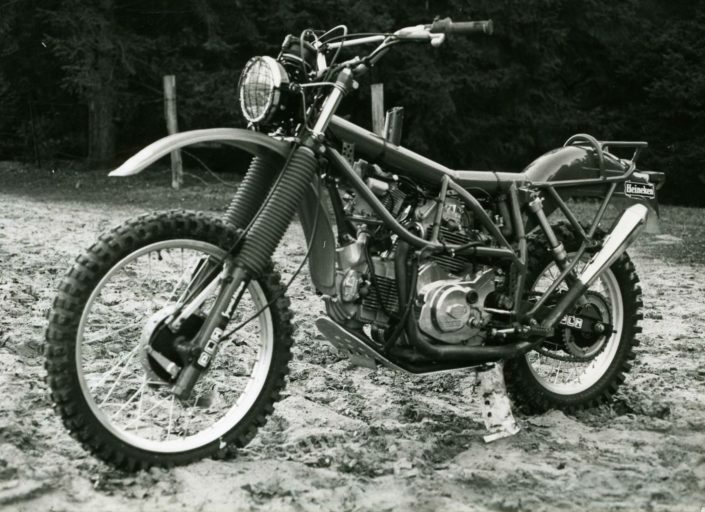 The bike, a liquid-cooled twin-cylinder, specially made for this type of racing from the HRC, the Racing Division of the House of the rising sun, developed more than 70 HP liquid-cooled and was the first motorcycle to win the tough African competition. The scale model 1:12 is made by Tamiya Japanese. 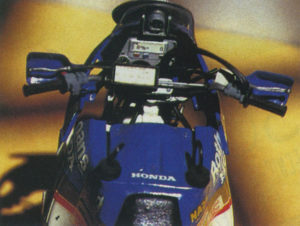 Inside the fairing is the digital dashboard with the compass road book placed on the handlebar. 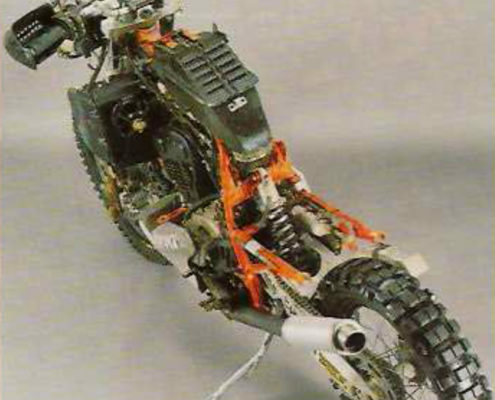 The chassis allows for perfectly the engine block with the muffler and various sleeves. 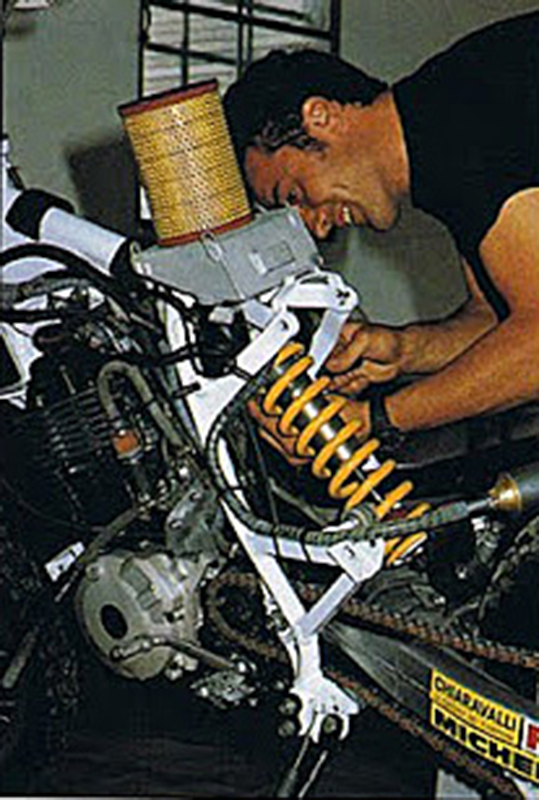 We start the installation after studying the various pieces that make up the Kit. As always the quality is high, with printed well finished and free from processing burrs, and with metal parts, as the rear shock absorber spring and the protective Grill of the etched plate headlights. 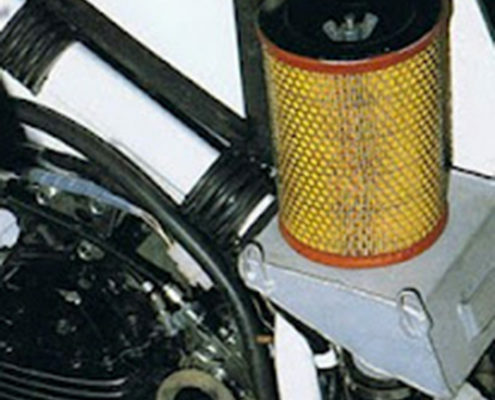 Following the directions on the painting of various engine parts, We begin the Assembly with the inclusion of the various cables and hoses supplied. 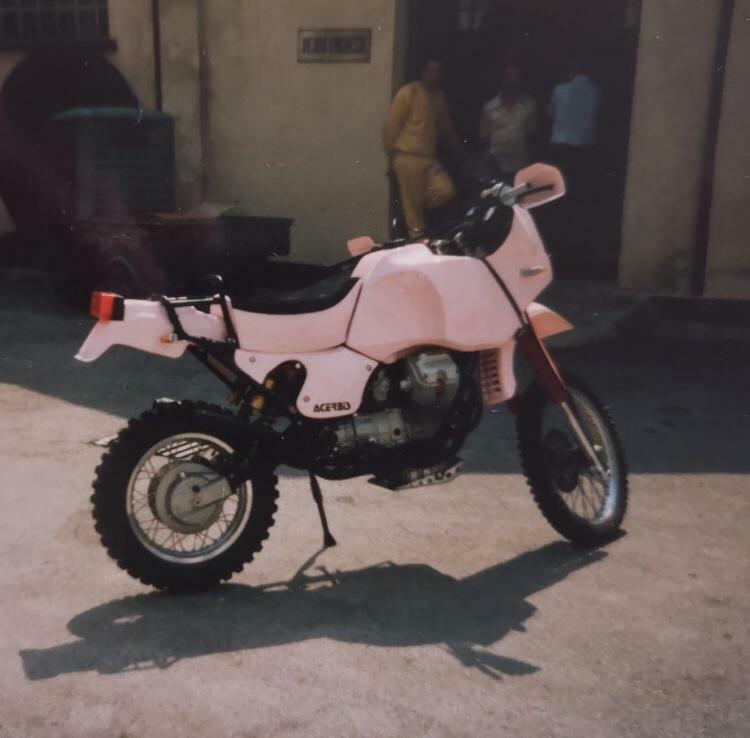 The frame, in two pieces, welcomes the engine block to which are added the potholes and the latest accessories that complement. 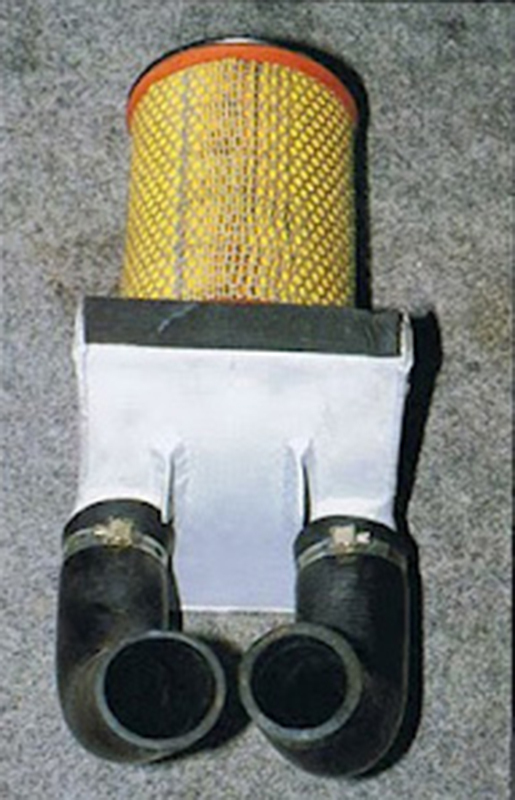 Useful directions to cut perfectly tailored various pipes made of two different diameters to differentiate that way cables from handgrip. 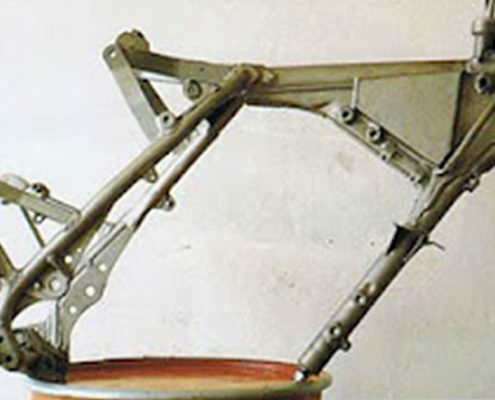 At this point let the chassis Assembly starting from the swingarm. 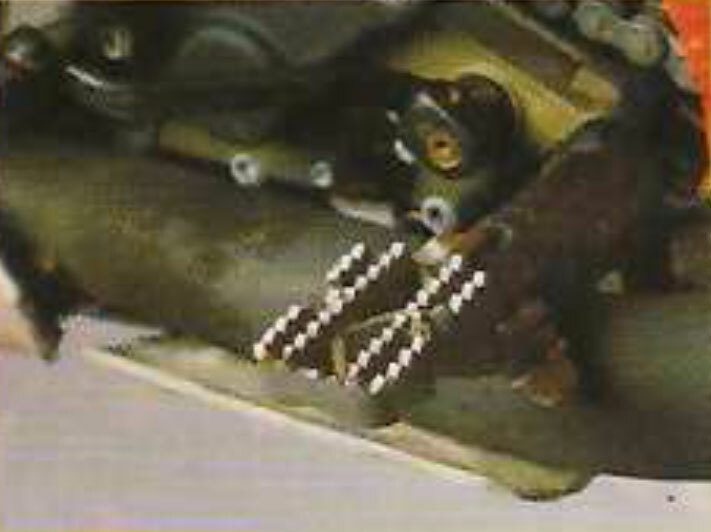 The chain is made in one piece and also includes the Crown. 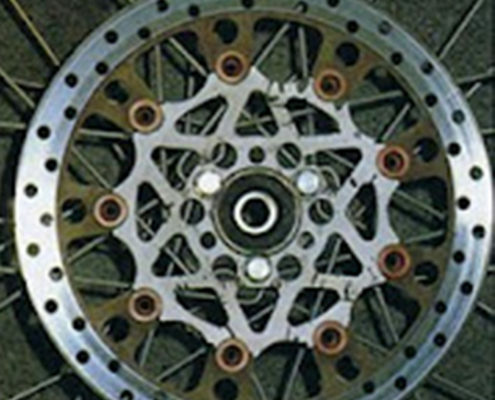 As for the wheels, you have to make sure that the two halves of the circles are securely glued and the glue has dried before mounting the tyre, in order to prevent the rim to unfold. 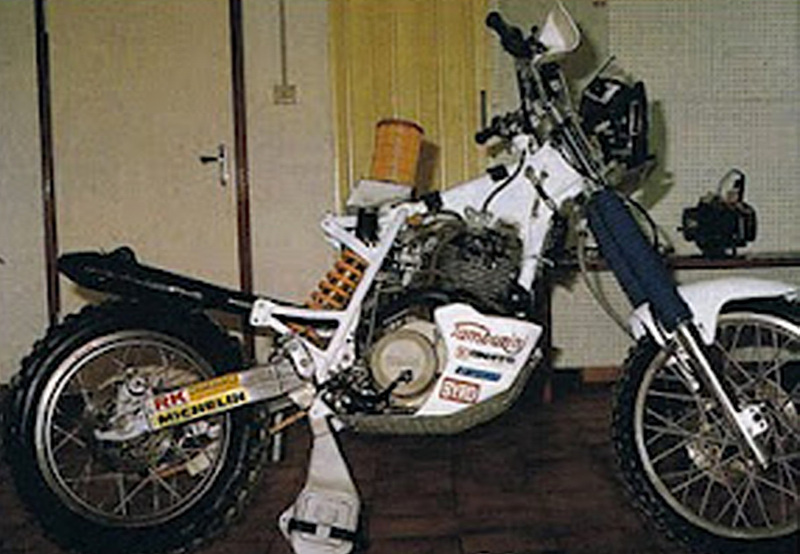 The rear shock, Despite being fixed, consists of several pieces which make it very true to the original. 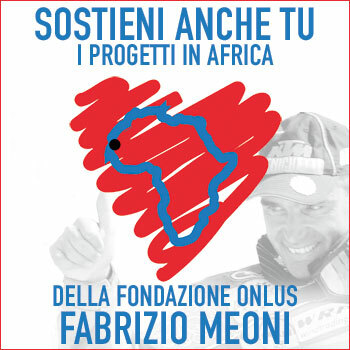 Starting the Assembly of superstructures must arrange for coloring of some details. 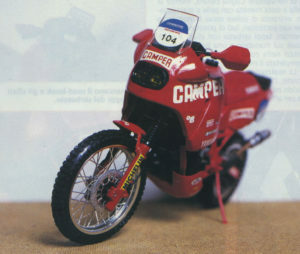 Even for Honda NXR 750, reproduced in scale 1.12 from Tamiya, the quality of the various components is high. 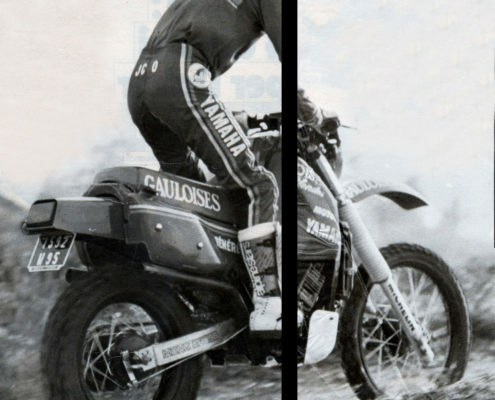 The prints are in fact well turned out. 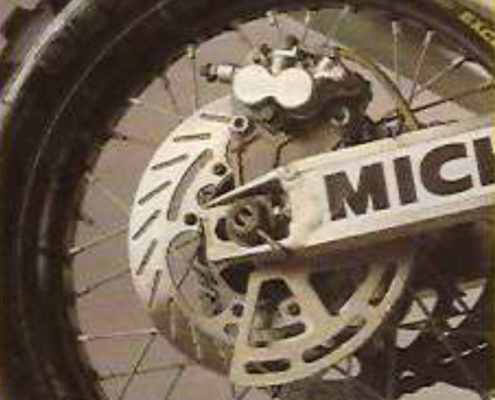 Several metal details, including the rear shock absorber spring. 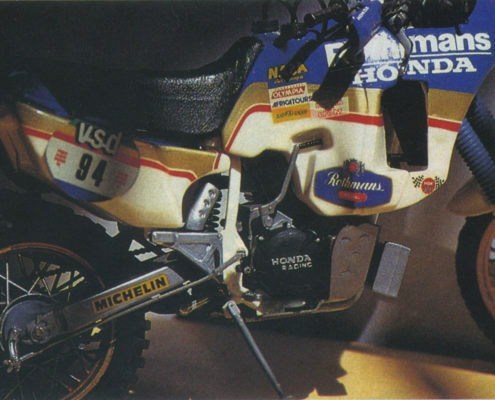 Since the Golden band of the Division is accomplished by simply color the decal blue zone extending it a few millimetres beyond the decal for the latter to overcome the colour and then give a line of perfect Union. 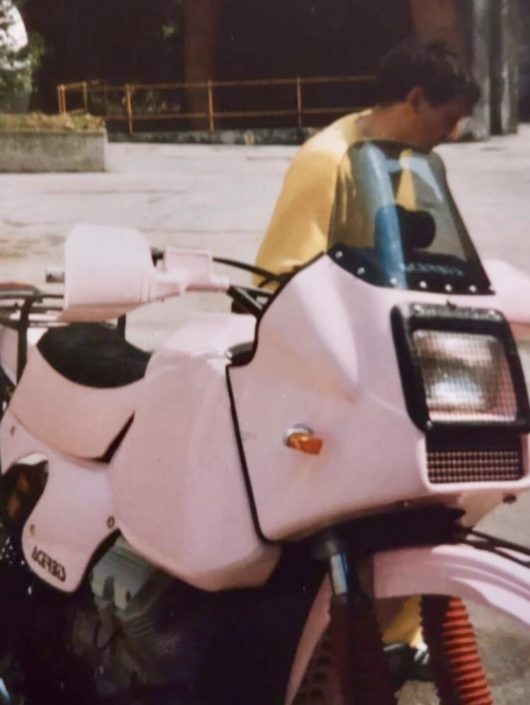 A Council: make sure that the color is completely dry before placing the extra tank decal with the pigtail is the first piece of bodywork to fit. 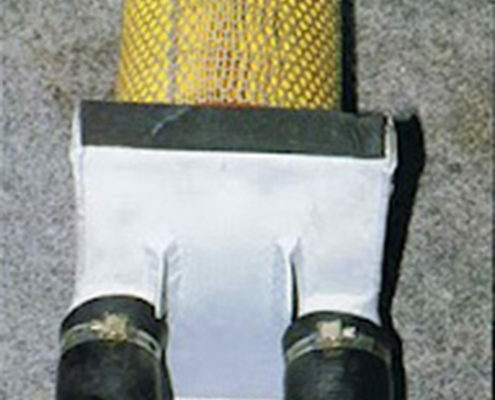 We then move on to the mounting of radiators with the support frame and is completed by the inclusion of various sleeves. 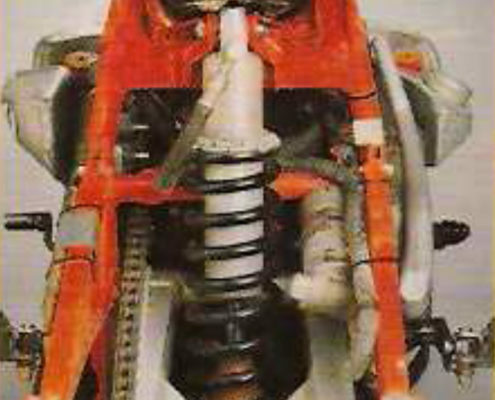 The tank split in half is the other component of car body which tackles before moving on to the fork mounting, with its front wheel seat and door plates side number complete the mounting of the rear area. 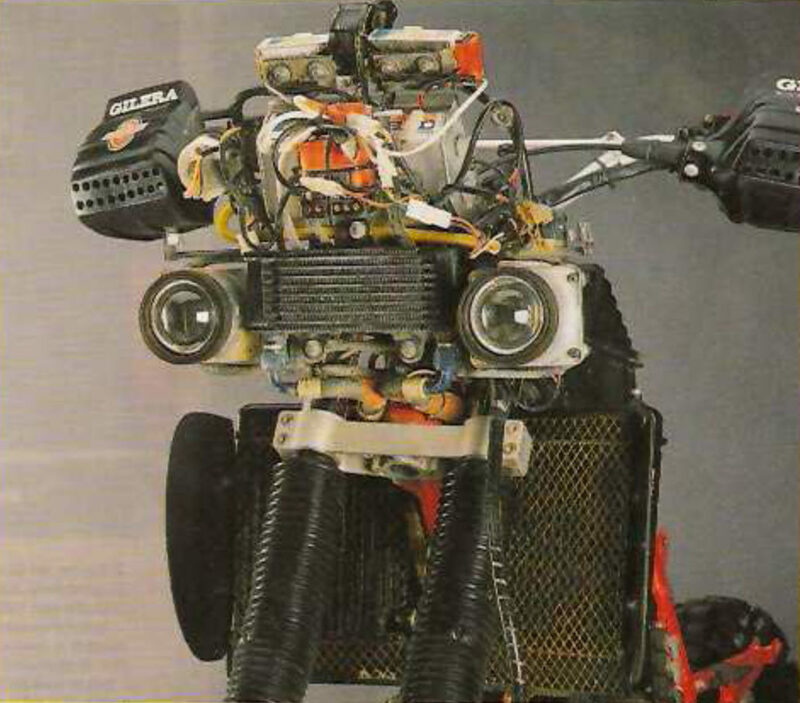 Inside the fairing place, placed in a special support frame, the headlight headlamp and the digital dashboard with compass. The road-book is placed on the handlebar and should be completed with the printed instructions faithfully reproducing some notes of course. 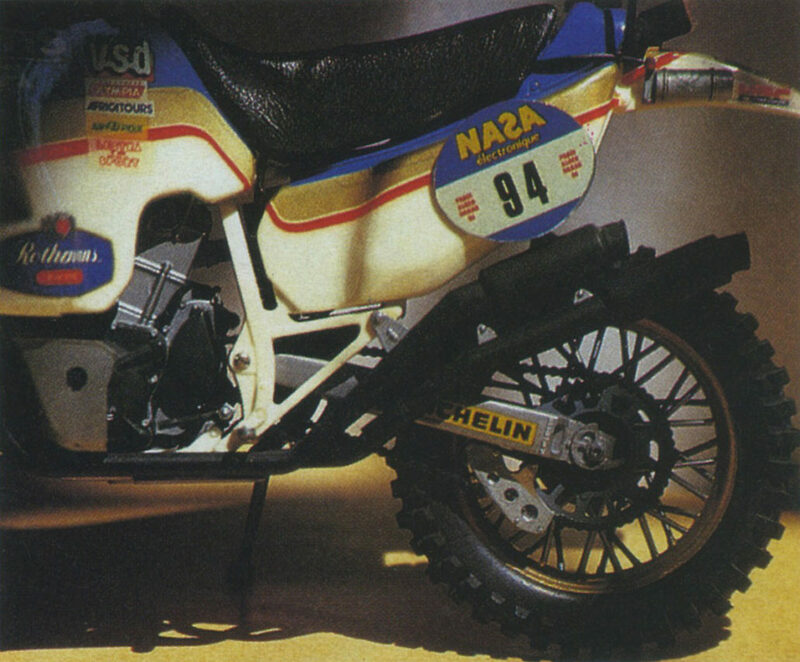 Mounting the fairing is the final step to complete our model. 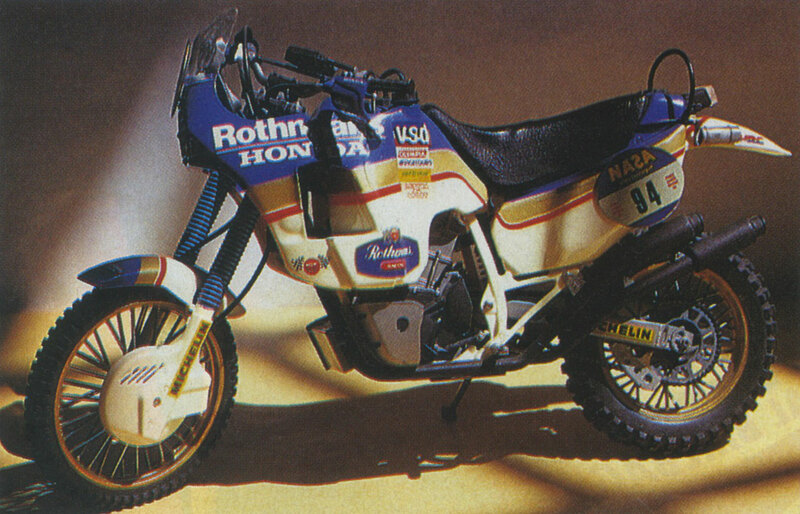 The protective Polish for decals (making them uniform with painted areas) is the final touch for this Honda NXR 750 reminiscent of the wide expanses of sand, the dunes and the charm of the great African raid. 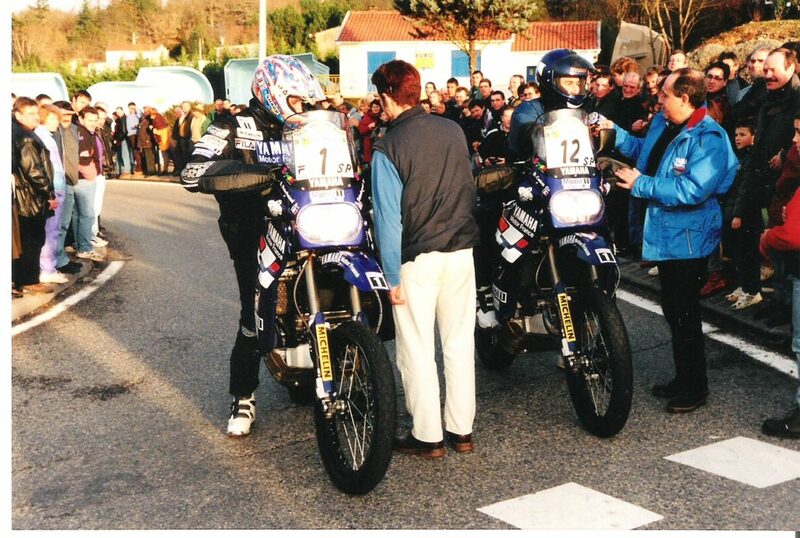 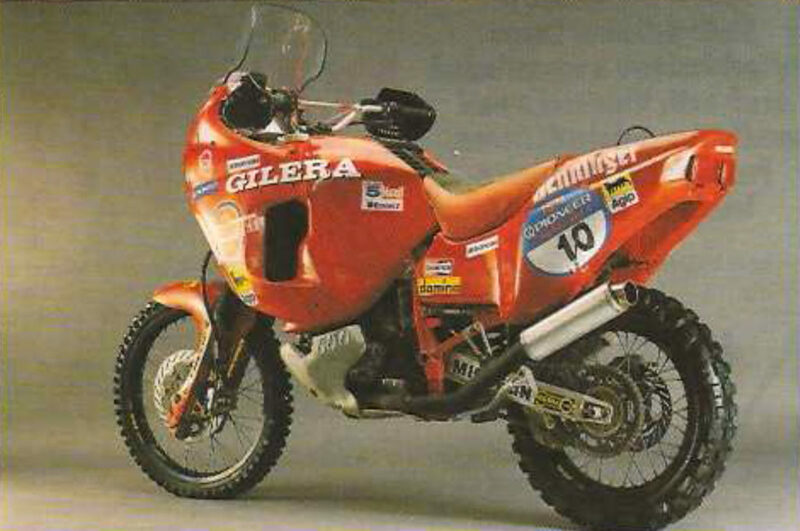 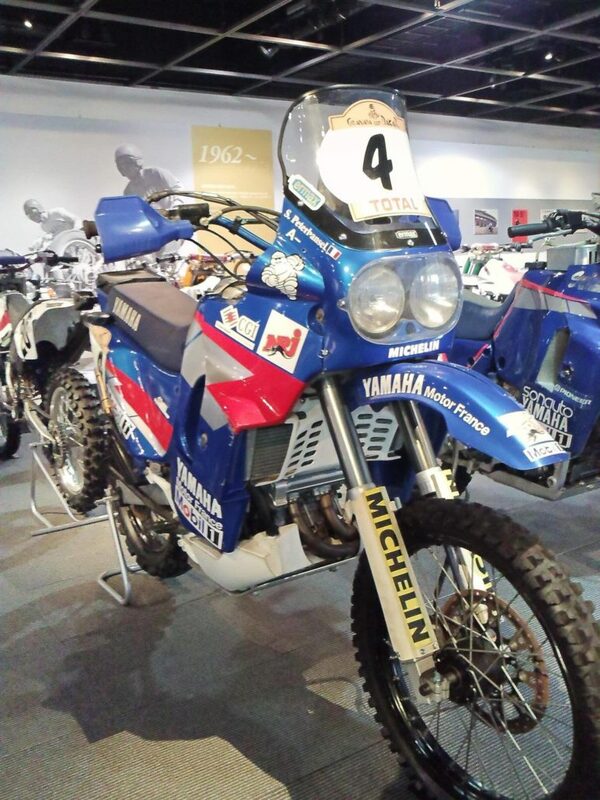 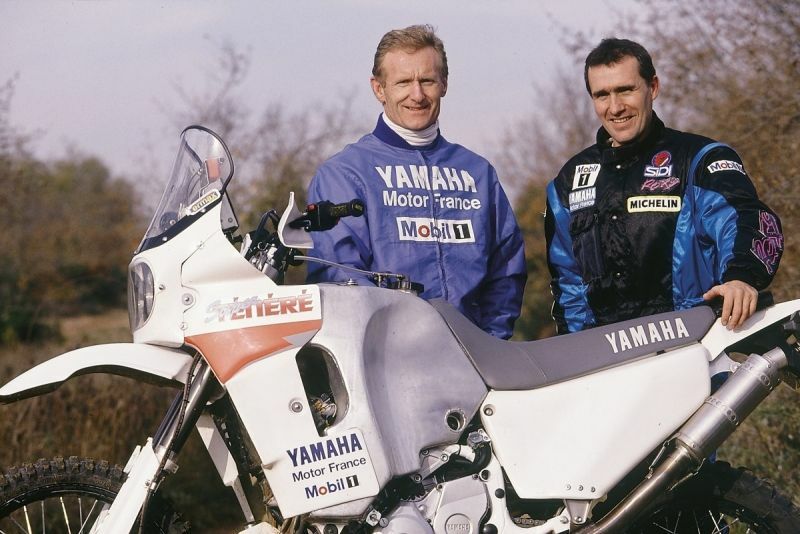 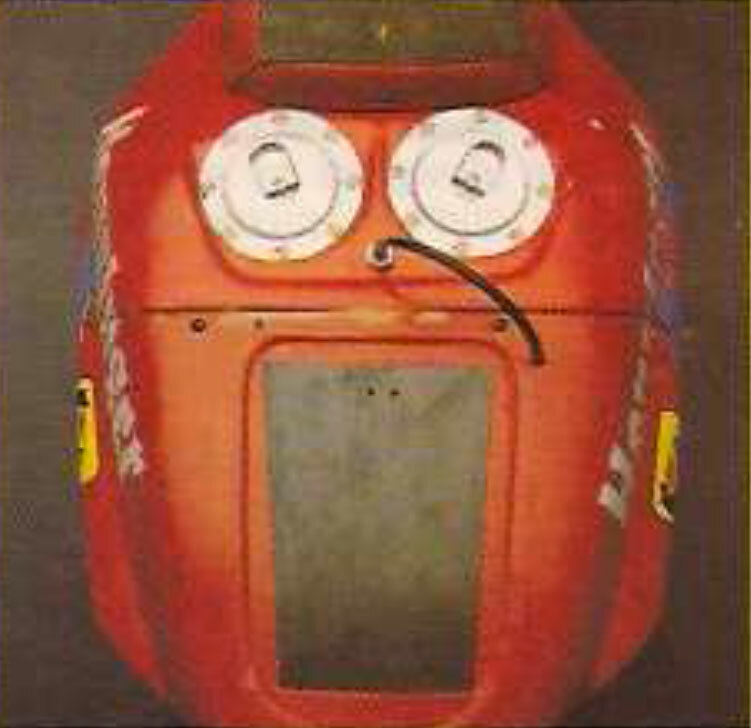 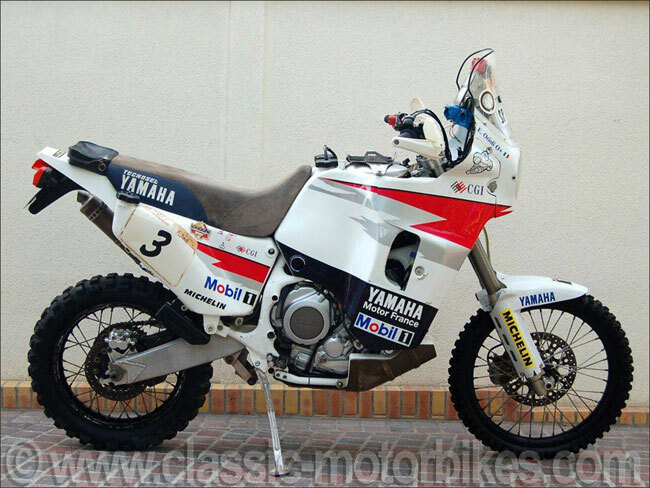 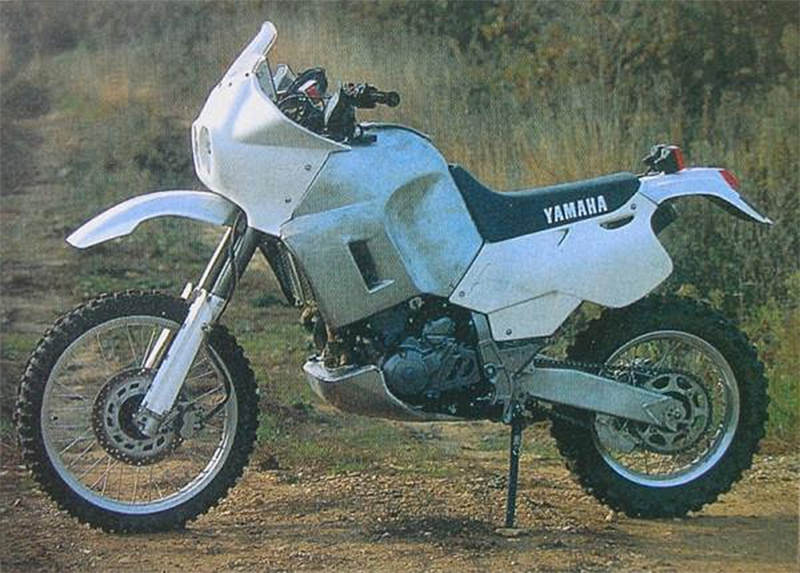 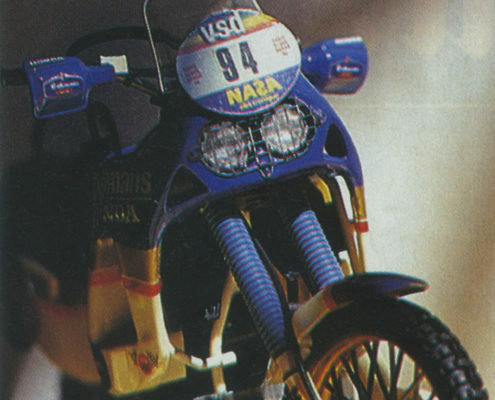 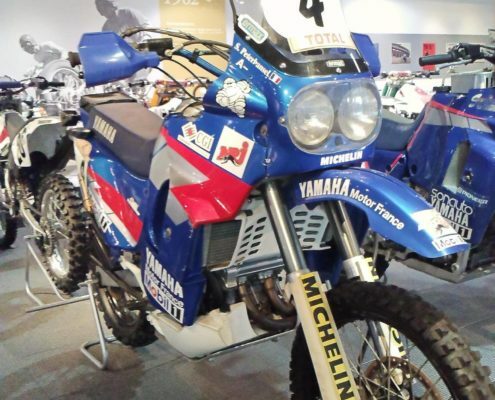 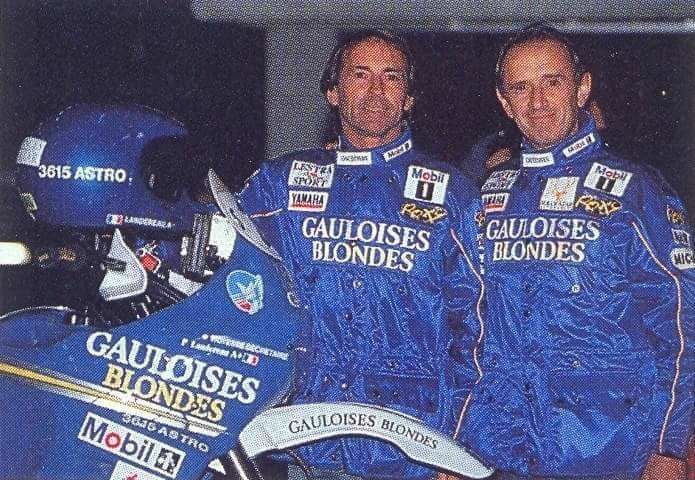 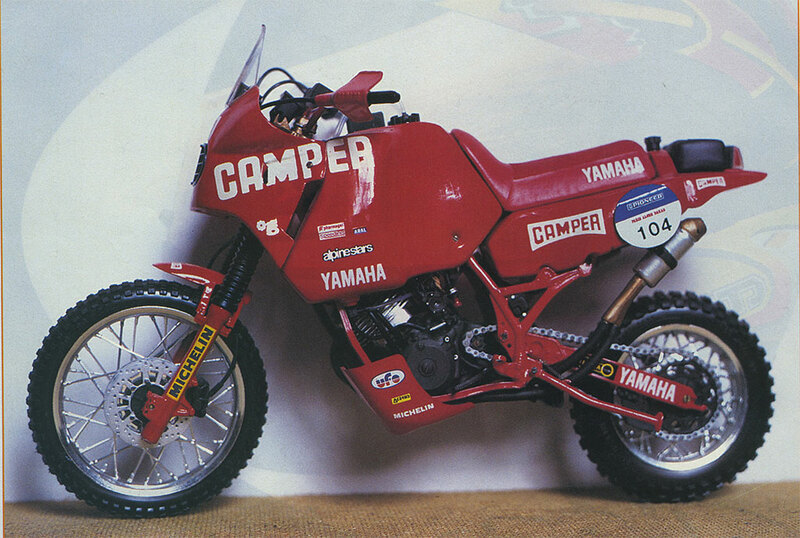 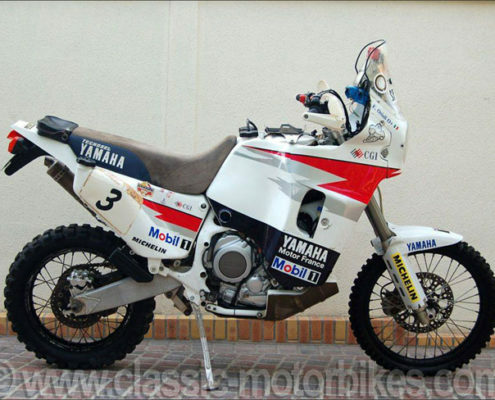 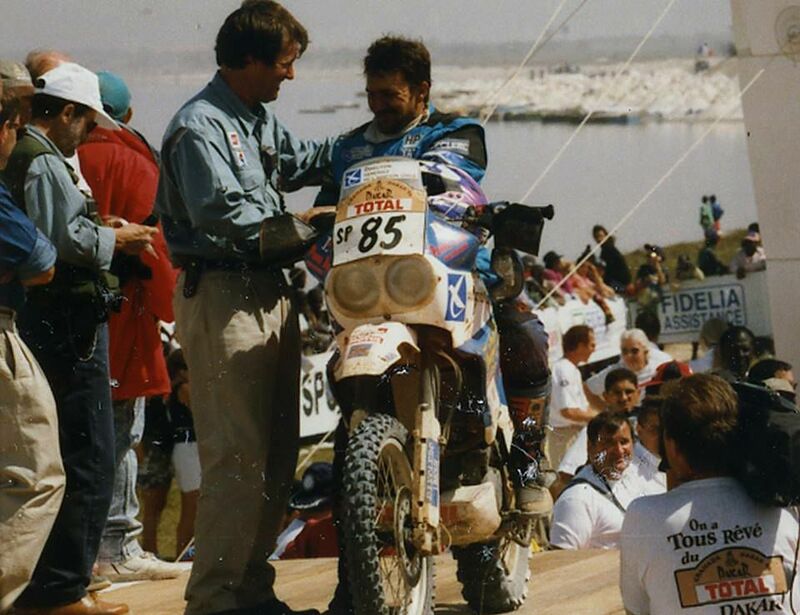 For three bikes which have concluded the Paris Dakar were taken, as a starting point, the engines of the XT 600 1989 and the TT frame 600. 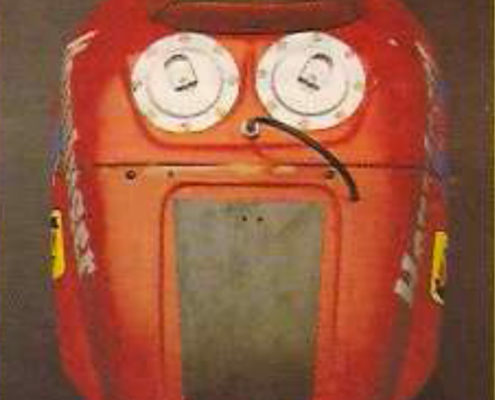 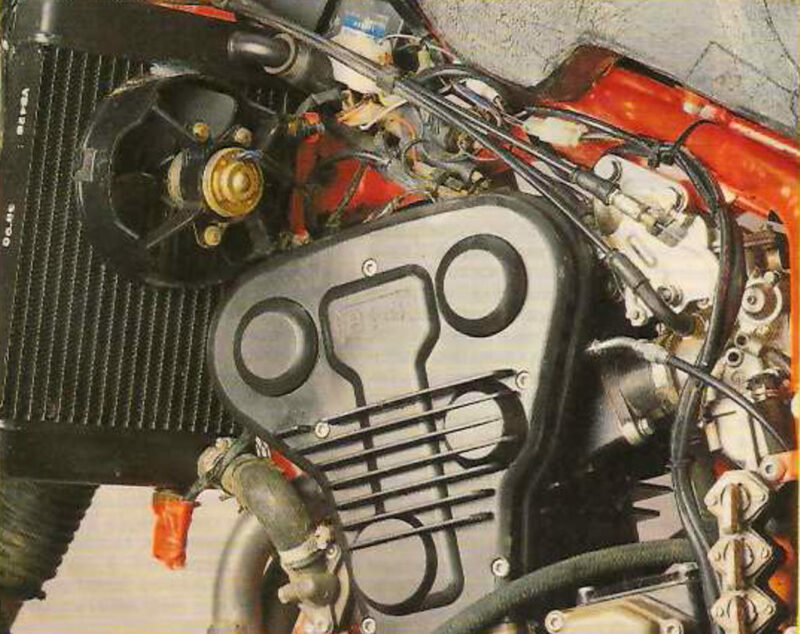 Interventions on the engine were not radicals. 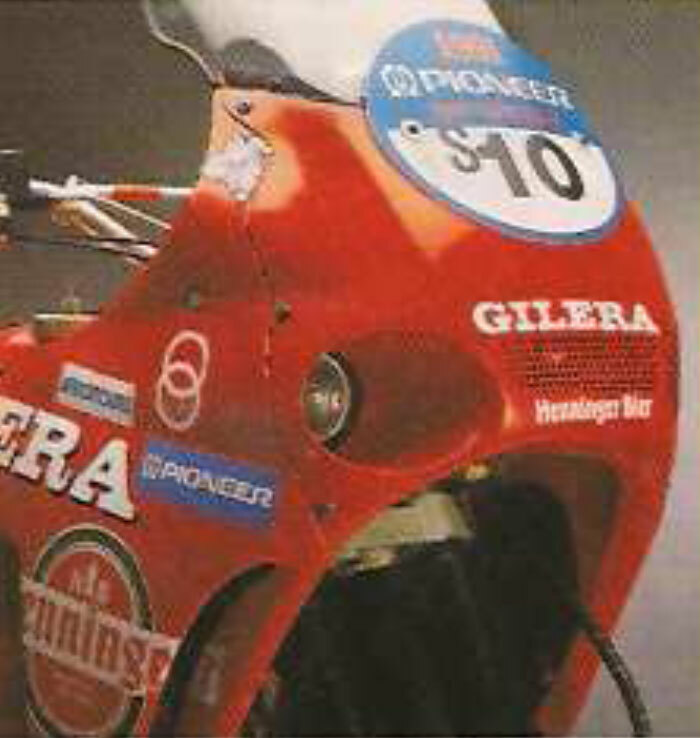 No additional cilindrrata, but only a particular tuning. 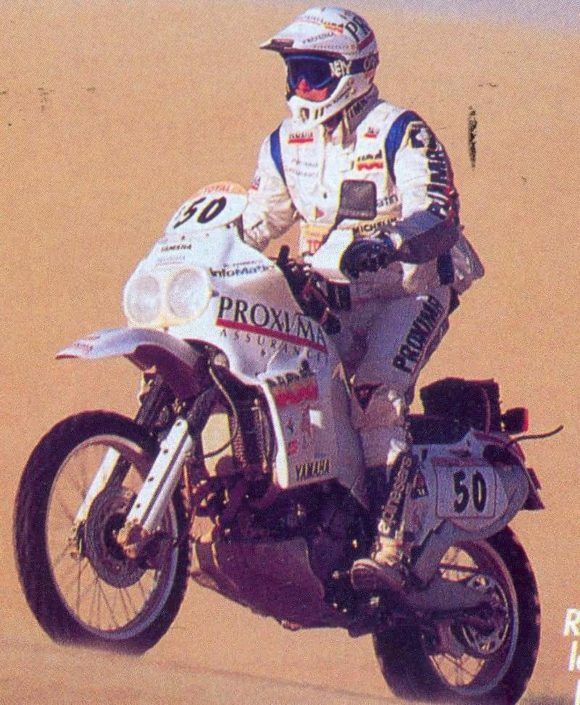 The decision not to proceed with the preventive replacement halfway through the race the engine (that would have implied automatic disqualification from the category silhouettes) obliged to maintain normal stresses and sizing. 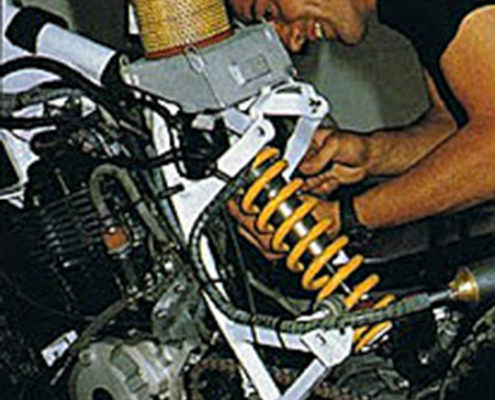 A slight crimping of pipes, an oil cooler (the Yamaha 750 Mono five valves), the kit camshaft BYRD to process the TT 600, intake filter box redone to accommodate the paper element of Renault 12(the only one to be in every corner of Africa) and an accurate fuel tuning, are the few interventions carried out on the engine. 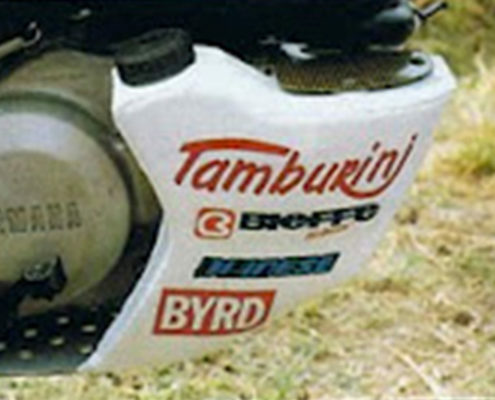 The exhaust system was built from scratch on the BYRD, competition exhaust system with a megaphone and end friction Cone, It's sheet 0,8 mm thick. 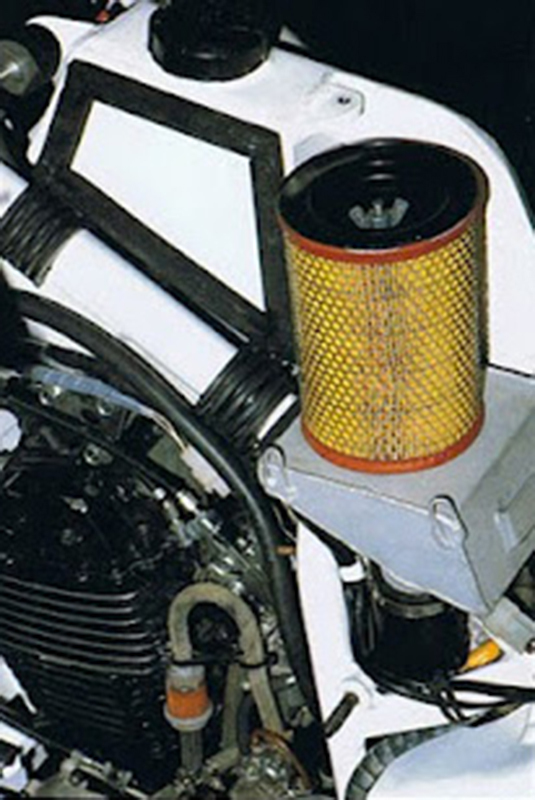 The collectors into the cylinder were kept in two pieces (one for valve) It was connected to a silencer for European transfers. The ignition was the original of the former as well as the cylinder piston valves and cylinder head; the latter equal in engine engine XT 1989. 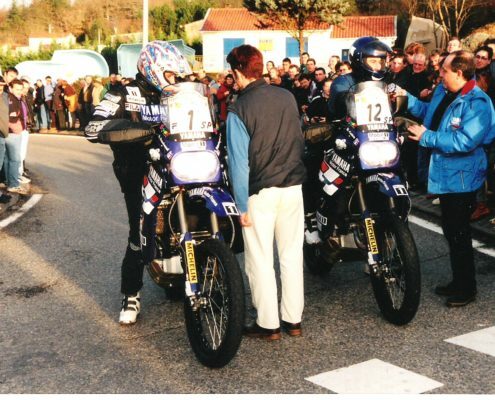 The choice of layered cylinder rather than with TT galanico 600 was made to enjoy greater reliability towards the inevitable intrusion of sand. 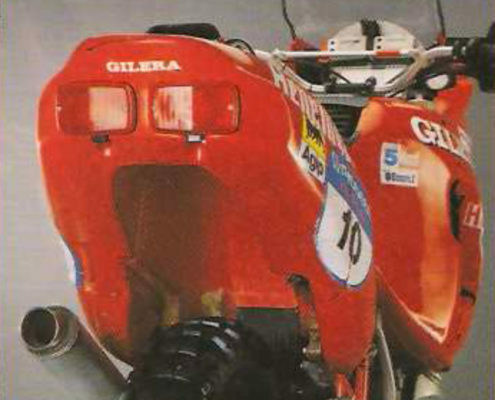 The Carters were sandblasted and painted external transparent but only for aesthetic reasons. 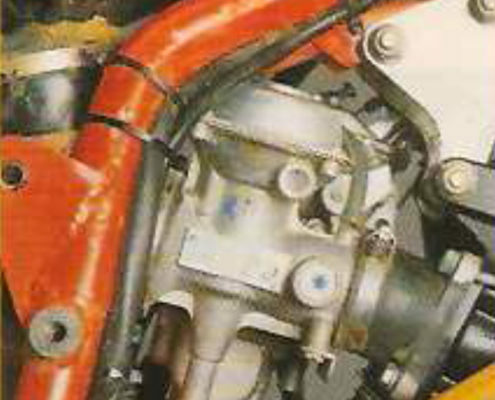 Carburation was then retouched with a decent minimum and maximum jets enrichment. 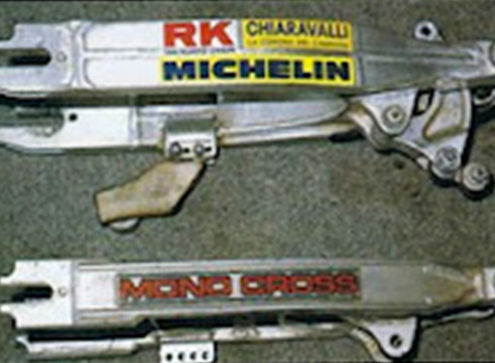 The original Crown was replaced with a steel combined with an RK chain Chiaravalli self-lubricating o-rings, leaving only the original pinion. 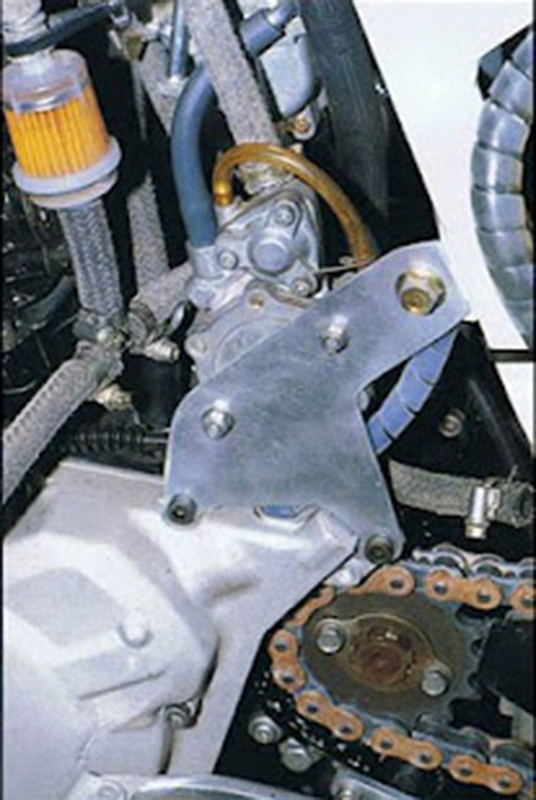 Also noteworthy is a reinforcement for post transmission control, with a lock washer against the bumps and scratches. 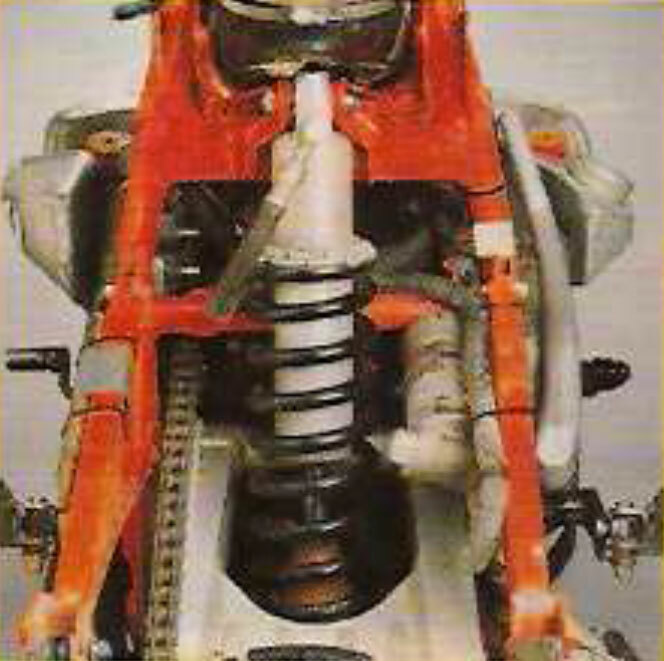 The lubrication of the engine and gearbox was reliability at a good grade as the Shell Helix. 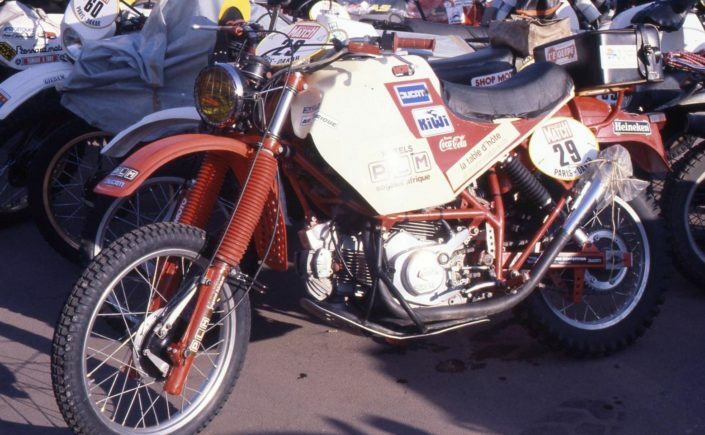 During the race the maintenance of each bike to required three candles, four oil filters and three complete sets of chain sprocket Crown, countless air filters and gasoline and a complete carburetor for motorcycle by Marcaccini (paid well 4000 FR. 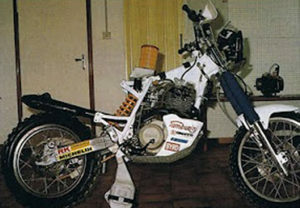 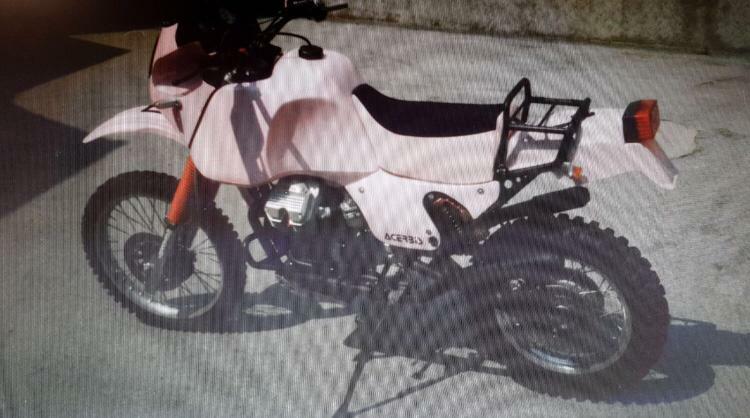 the Yamaha Sonauto). 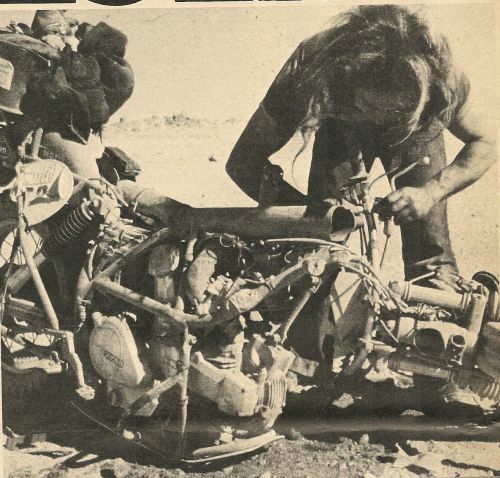 One mounted he inexplicably began to crank the engine regularly nor thorough cleaning has managed to bring it back in starting conditions. 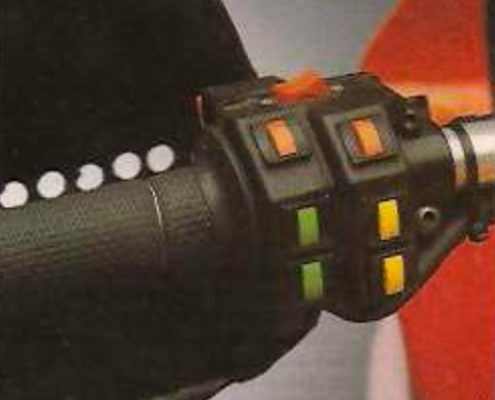 Also this important component has been completely redone, depriving him of any links superfluous and doubling it in full. 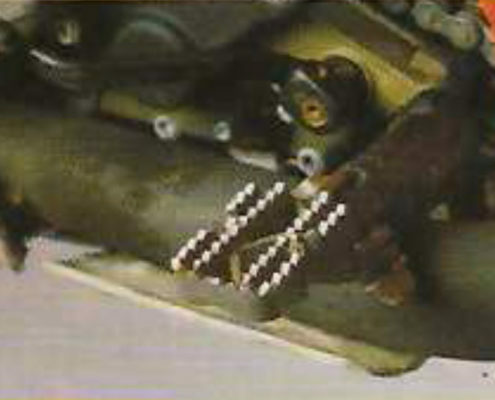 Then: two coils and two units. 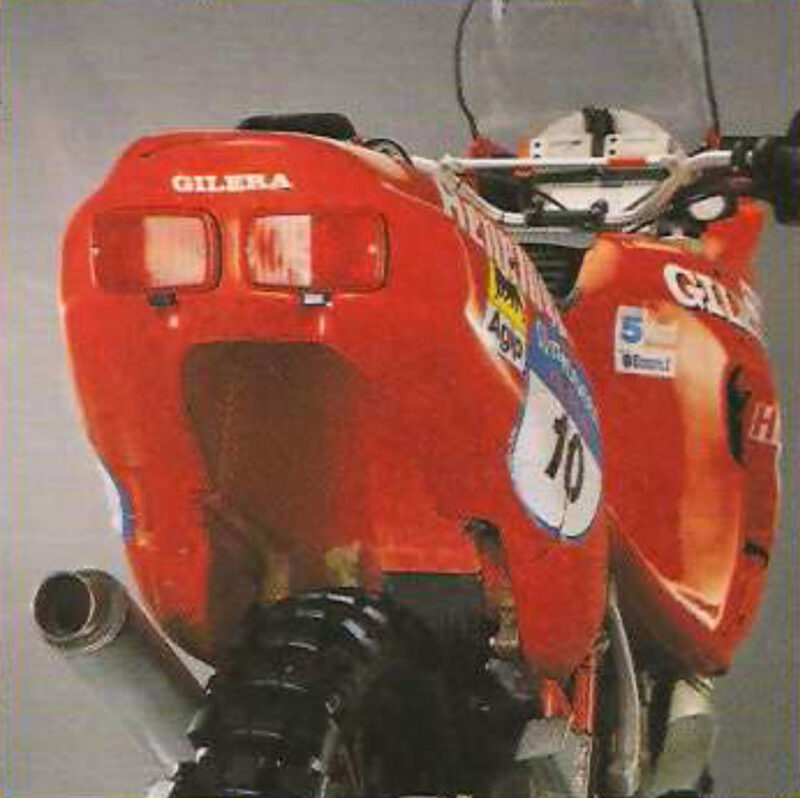 Headlights, two halogen lamps of the Fiat Ritmo were included in a fairing bracket that provides a separate regulation for the inclination of the beam, so you always get an adequate lighting in long discussions of the suspension. 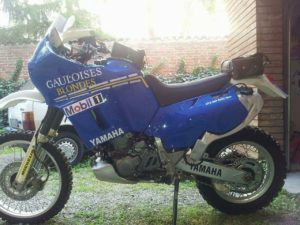 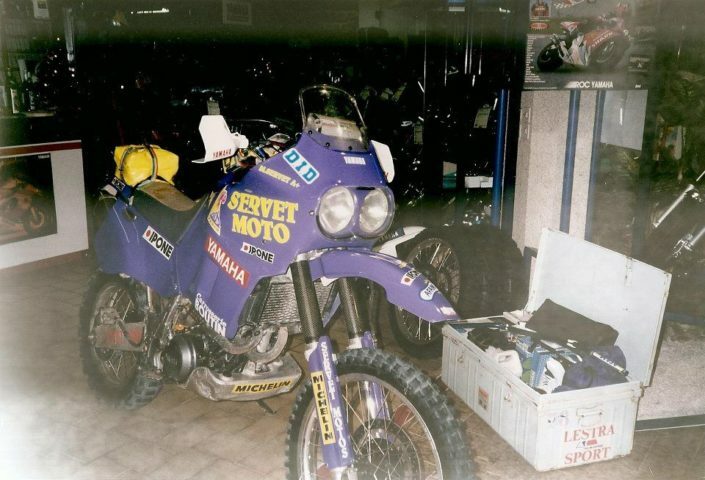 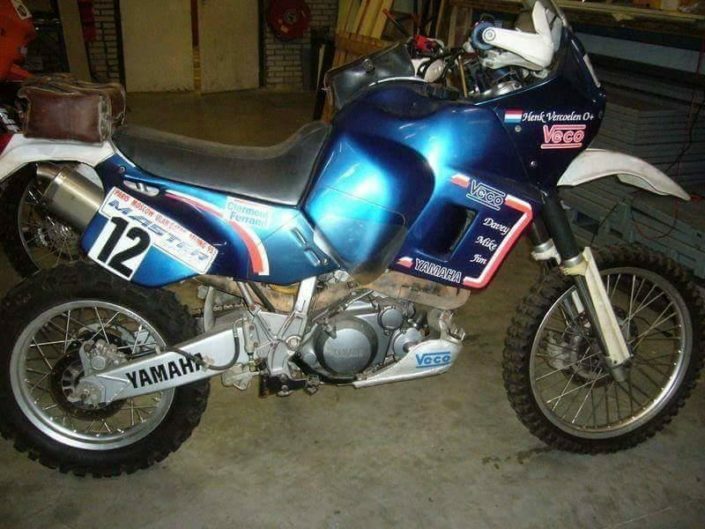 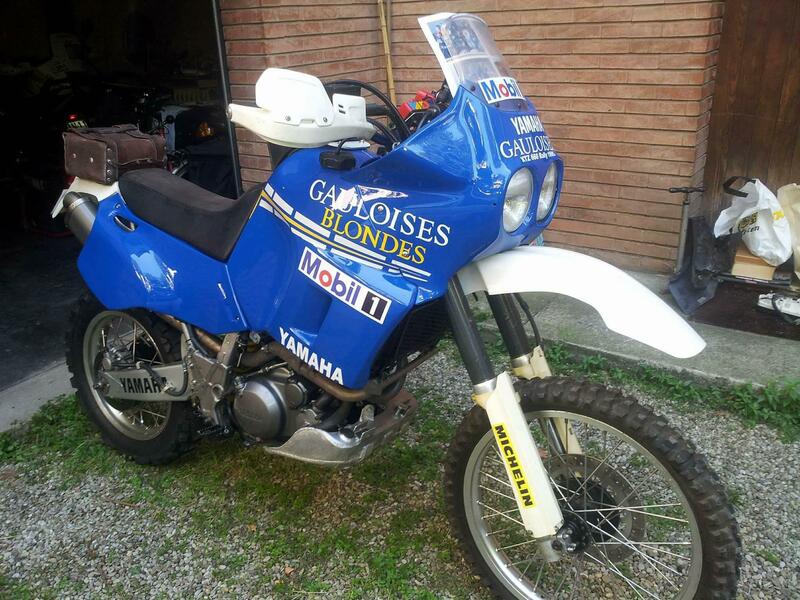 Sealed battery adopted, He provided the energy to pump gasoline from a Yamaha Tenere 600: universally recognized as the most reliable by the people motociclistista of Dakar. 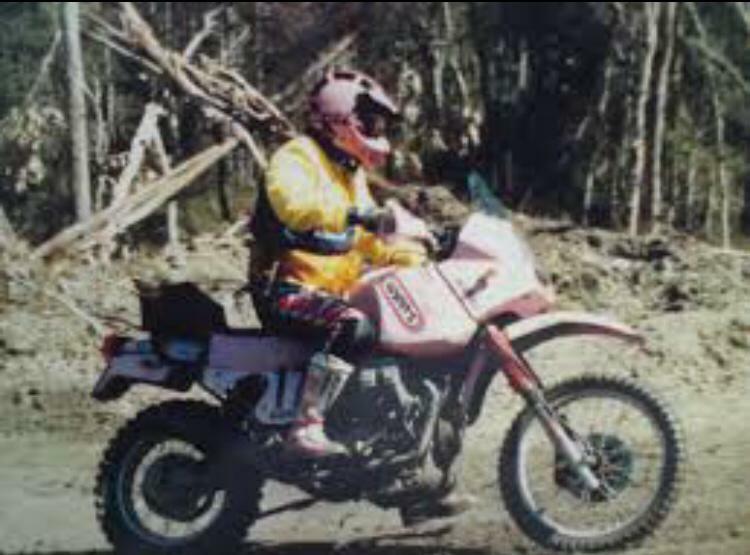 For navigation were mounted electrically operated Road Book of MD, the original wave trip master XT 600 R and a compass Aeronautics . 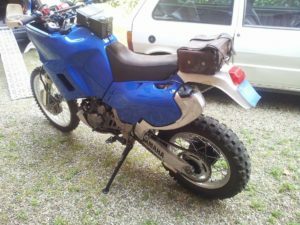 The base and the Yamaha TT 600 the front was obviously reinforced with welded handkerchiefs in the Steering area, but also to increase you search 1 liter engine oil capacity that circulates inside the tubes. 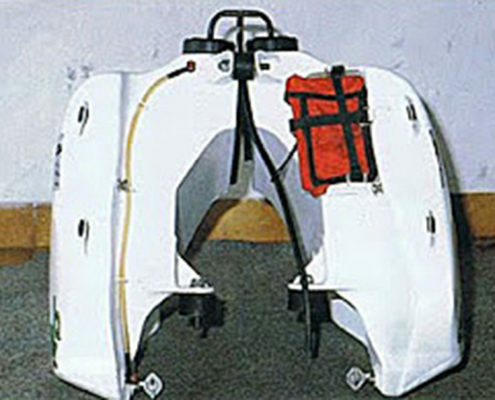 The bow steering profit was diminished with the usual placchetina by welded tube, measured the outer corners has a width of 50 mm instead of the normal 20 mm. 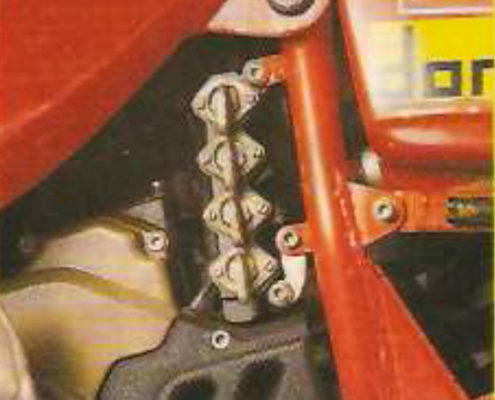 This is to prevent, in case of a fall, the fork tank backgrounds. 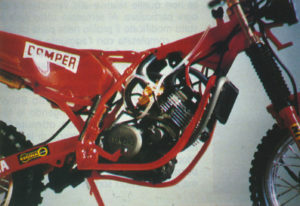 The back instead was redesigned is built completely. 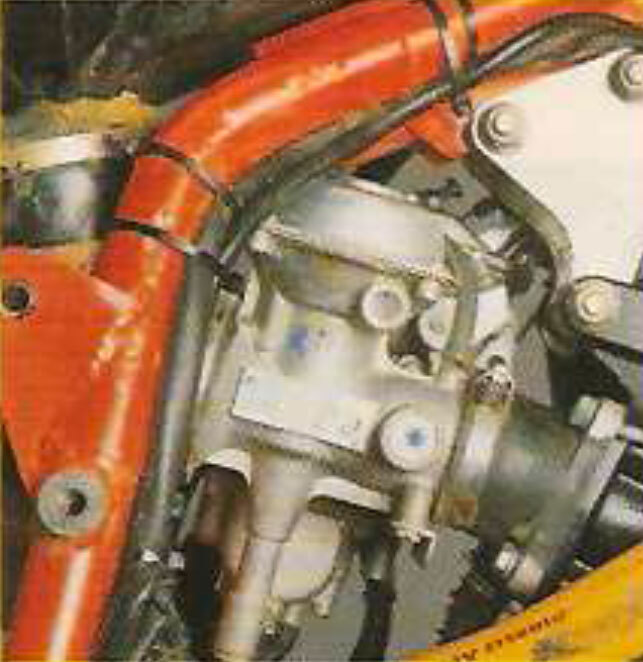 Swingarm attacks. However, more work was required by the design and construction of the swingarm. Longer and well 150 mm compared to the original, It was built in Carpental, the outdoor unit is 80 × 35 mm. 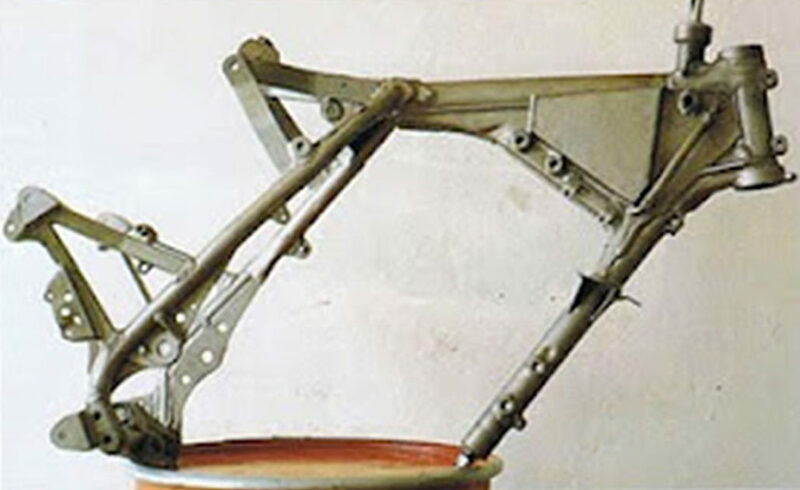 The attack to the chassis is done through two plates billet and combined with two arms for welding. 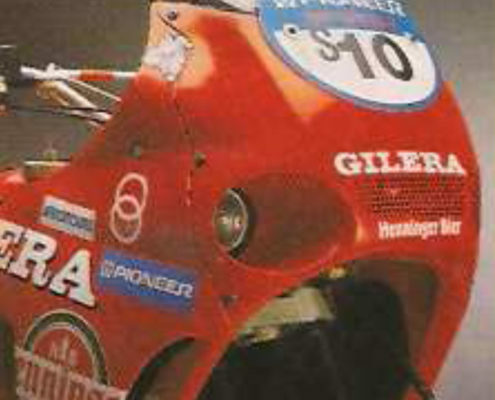 As you can judge from the photos the swingarm denotes a truly fine finish. 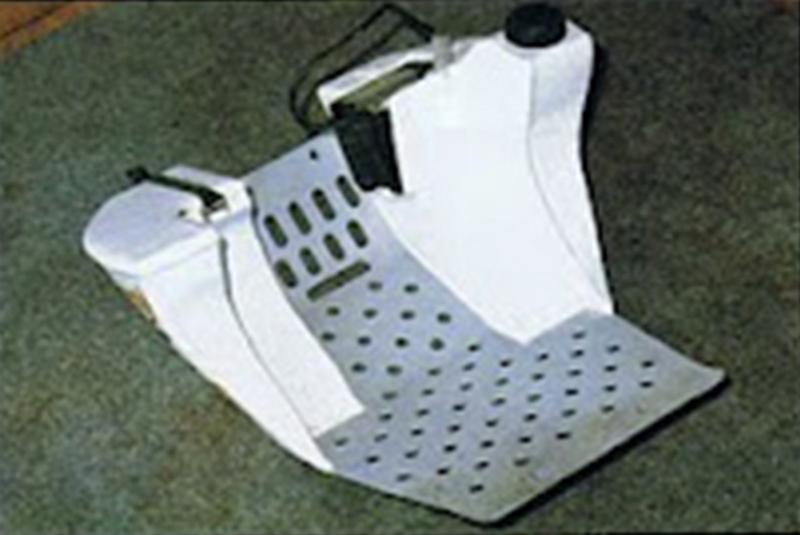 It should be remembered that all the workings of chassis that have been carried out with the help of specially constructed masks. 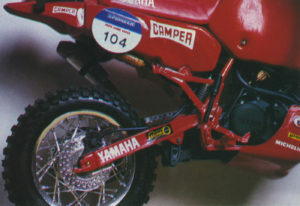 Jack stands, particularly important, lateral type and placed on both sides of the bike. 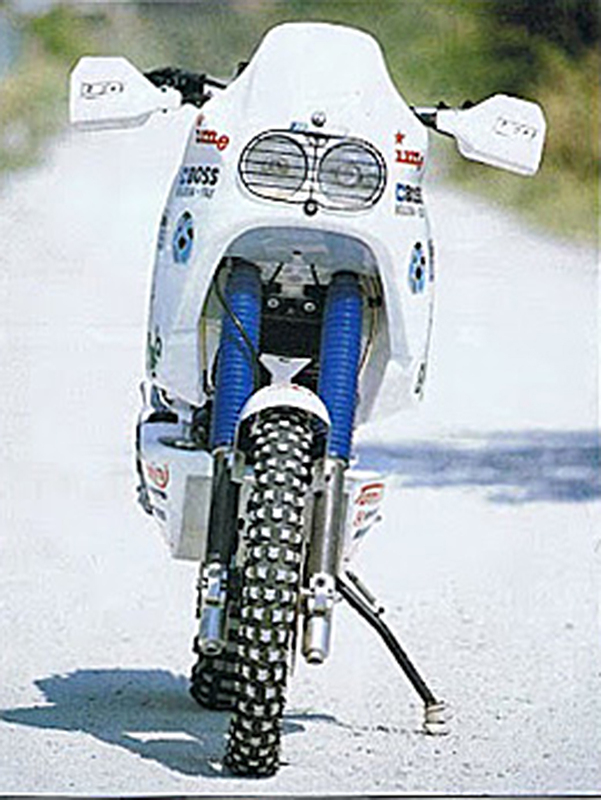 If lowered simultaneously, the rear wheel stays off the ground, allowing for easy replacement in the same. 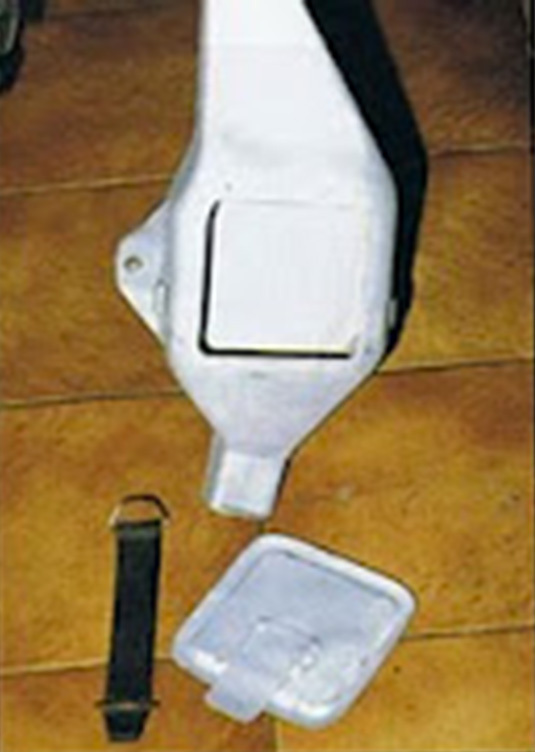 On the left keeps the original crutch enriched with a wide base of nylon to prevent better the Foundation on sand. 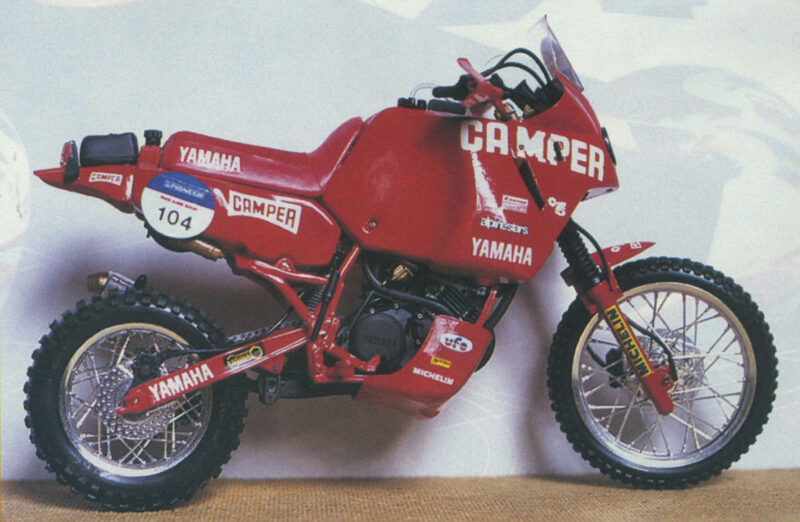 On the other side we find the type container gantry mounted by the official Yamaha. 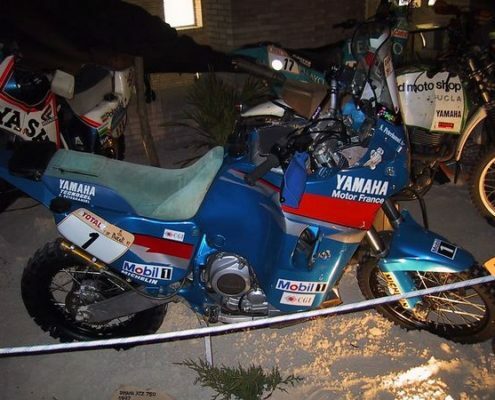 In fact was created on the basis of some photographs. 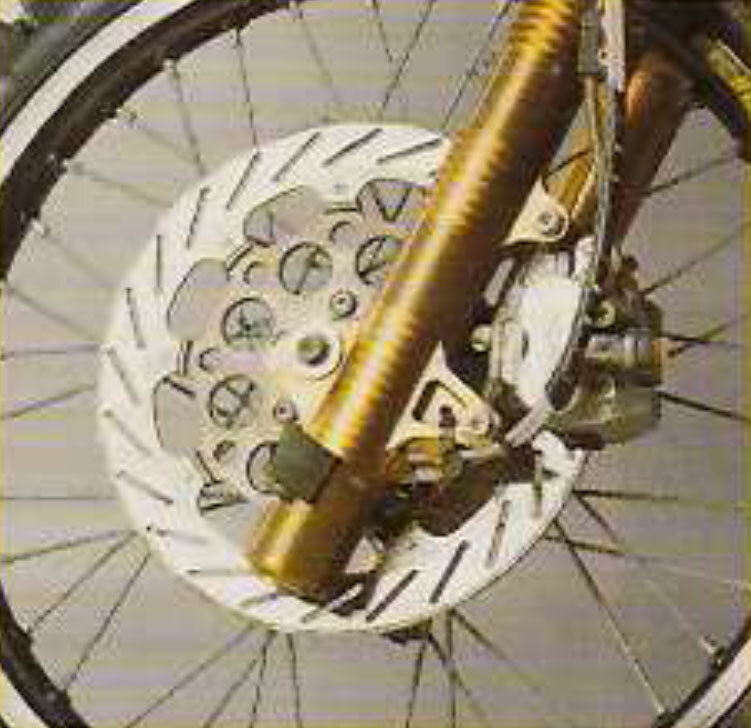 Billet fork plates that if working 2 Avional blocks 24, unchanged steering geometry, but increased the height of the same: 38 mm for the upper and 40 mm for the lower wheels were assembled in the workshop of Wild Team with hubs and spokes from officer, and normal production circles Takasago. 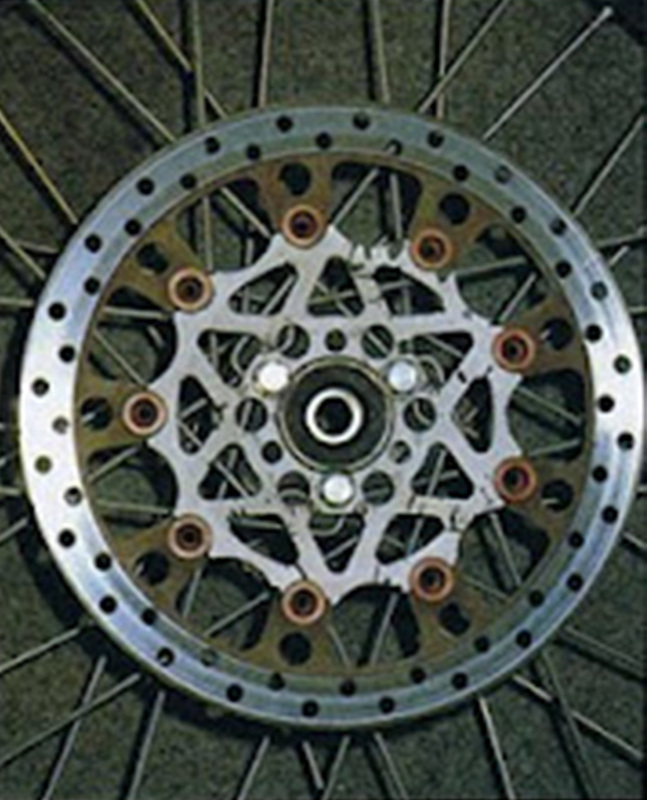 For the latter, however, it had to buy non-perforated for RADIUS, that was done after the specific drilling required from the hub, designed for rings DID. 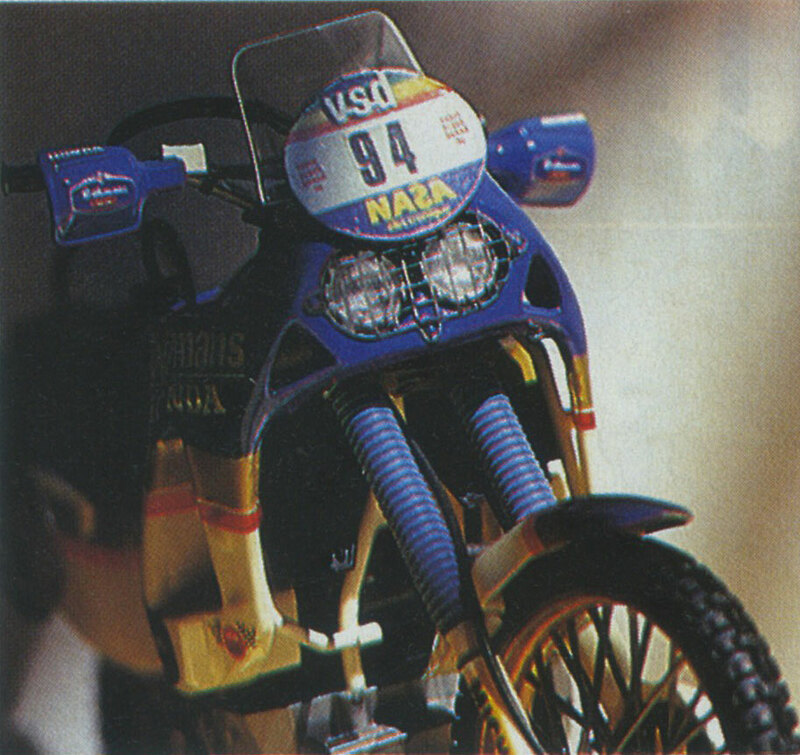 And caps wheels and swingarm Marcaccini's Malik went to the specialist Poggipolini, that takes them in steel, While the nuts and bolts, we tried to keep the original, judged excellent. 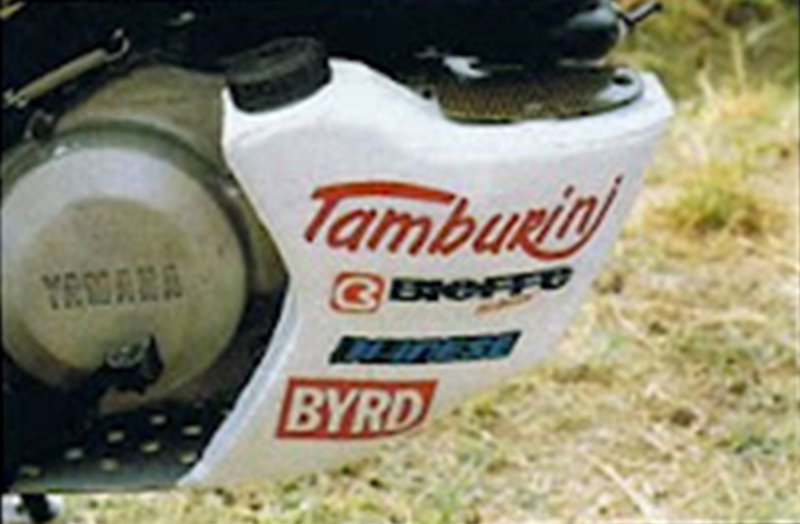 The brakes were supplied by BYRD and stand before a nice cast iron Brembo disk from 300 mm floating flange mount widely breached and made of light alloy. 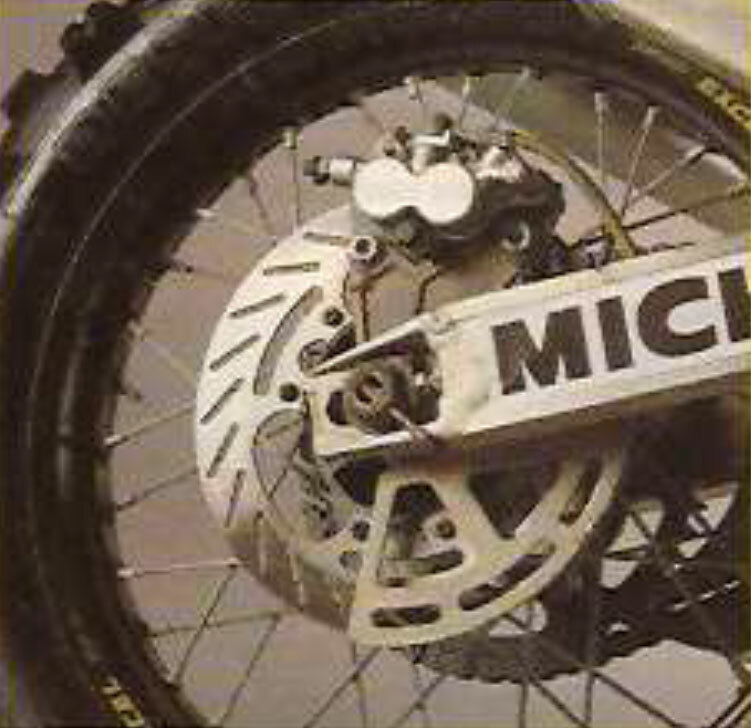 Later comes to help to curb the over 160 kg dry weight of this special steel disk 230 mm coupled even it has a two-piston Nissin. 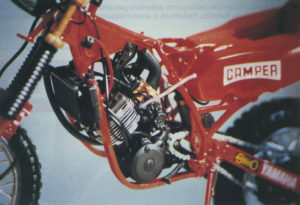 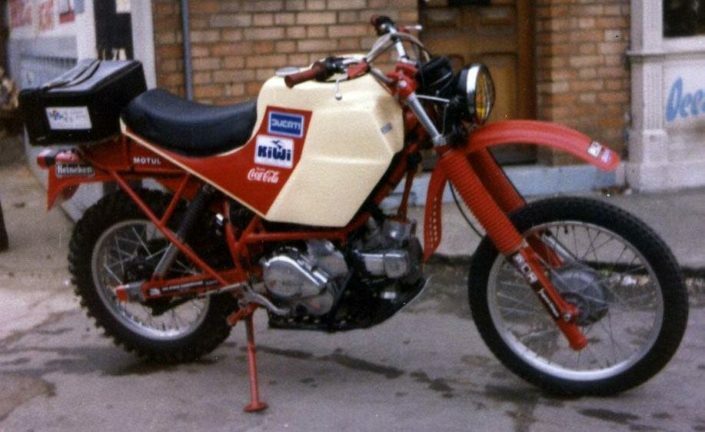 The handlebars are the original controls of the XT with electric ones modified functions. 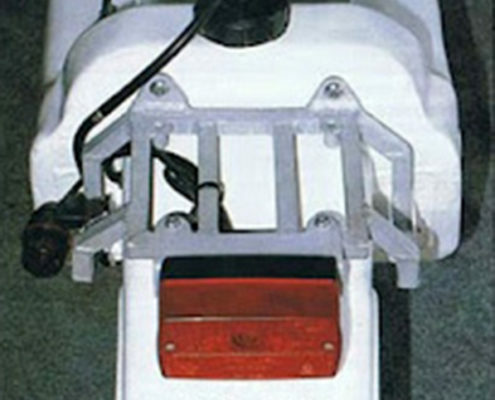 Only the handlebars, one Zachariah sets our have chosen for its exceptional strength, It is mounted with a particular bridge, always fold connecting the two fixture brackets to the top plate. 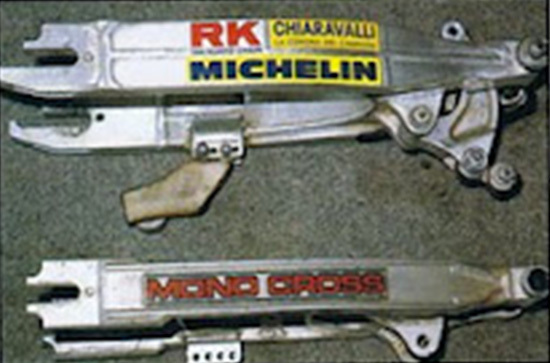 Thanks to this particular Marcaccini in 1988 could conclude 1000 km of a leg broken in half despite the upper triple clamp, with only the aid of a nylon strap provided by Clay regazzoni. Finally we left those who are perhaps the most important pieces to have functional and at the same time a motorcycle ride: receptacles for the location of 60 l of fuel which you must carry during the African Marathon. 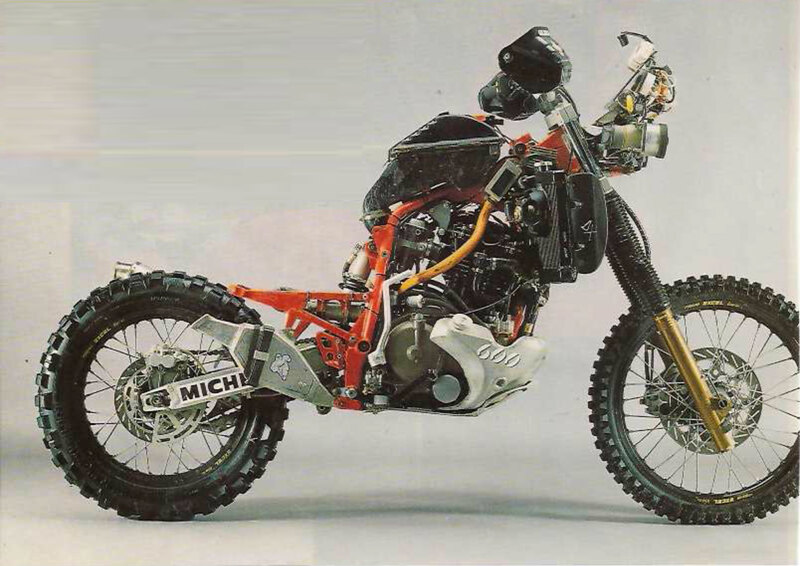 Build tanks for an enduro is not an impossible task, but do it for the Dakar, and then in the most robust possible is another deal. We wouldn't want to expire in rumors from shopkeepers, but the same official complained the last Gilera blazoned Paris Dakar, leaks from the tanks that the poor mechanics have had to repair often. 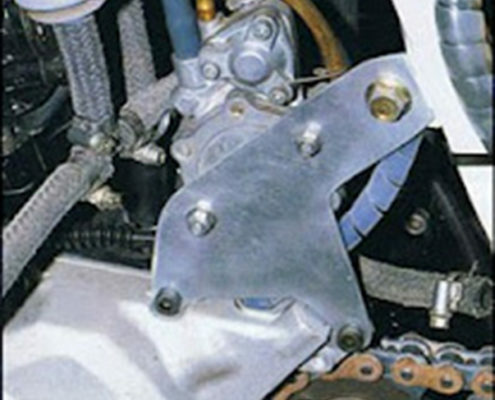 All superstructures for their special are their most successful details. 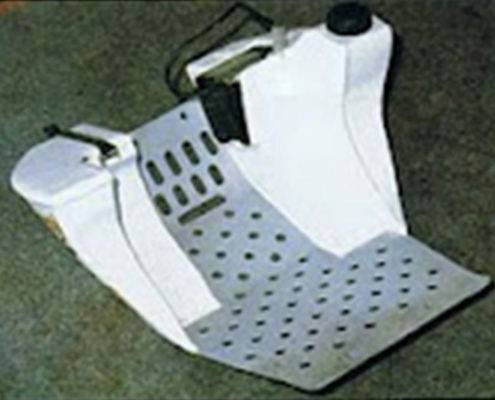 Made of folded aluminium sheet, shaped and welded as few but plumber can do. 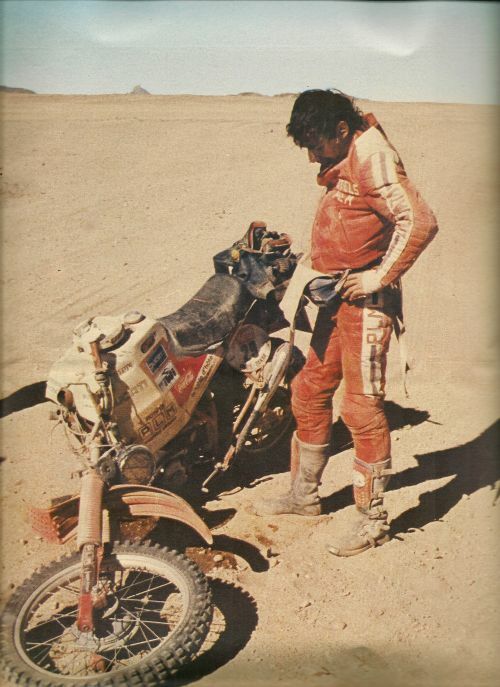 Please note that the bike protagonist of the service, though restored is still the bike that led Mabuya from Paris to Dakar. 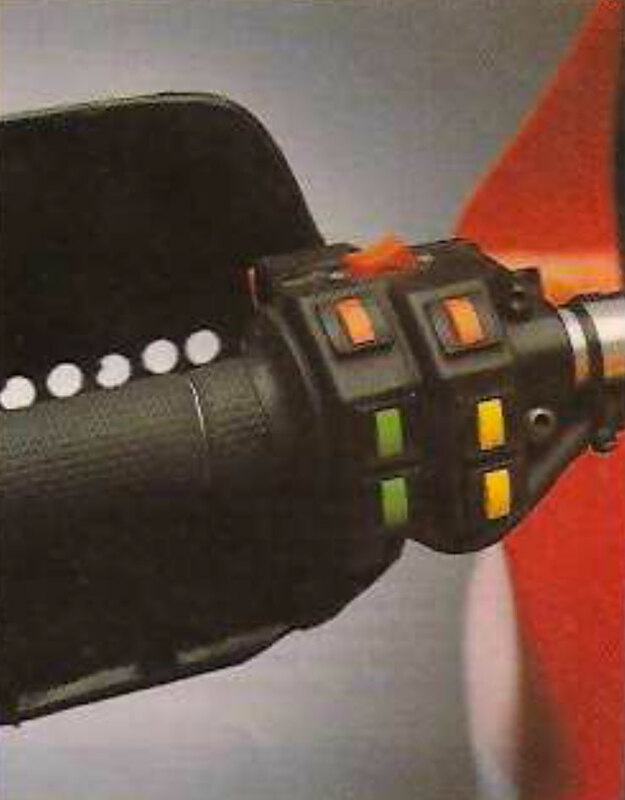 Coming to the point we find the two front tanks, for a total capacity about 45 Lt. easily removable with a link to communicating vessels for an immediate reading, while driving, gasoline still available. 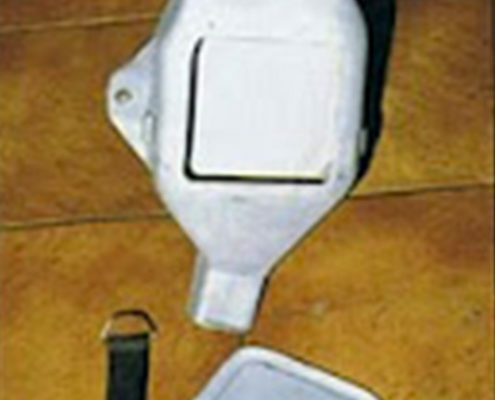 The draught of the precious liquid takes place thanks to the electric pump already mentioned, assisted by a trigger hand pump type rubber speedboat. 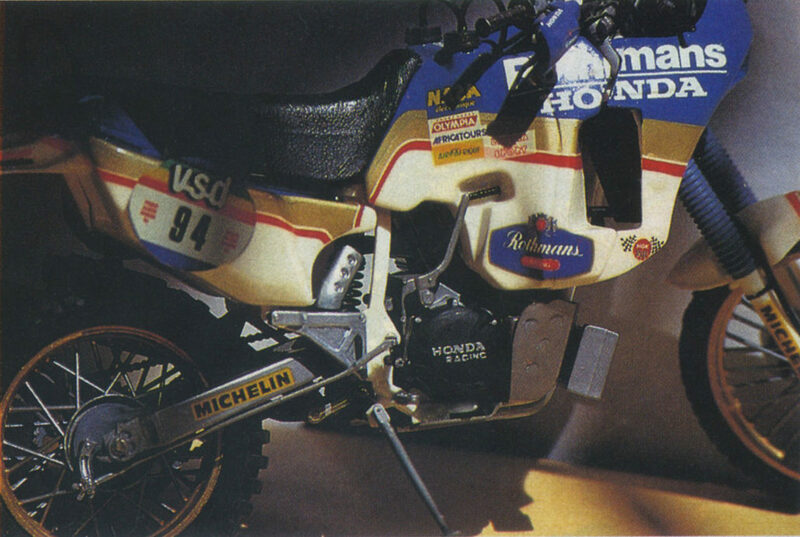 Under the seat, covered in faux suede, for better grip on the backside, There are others 15 Lt. of fuel. 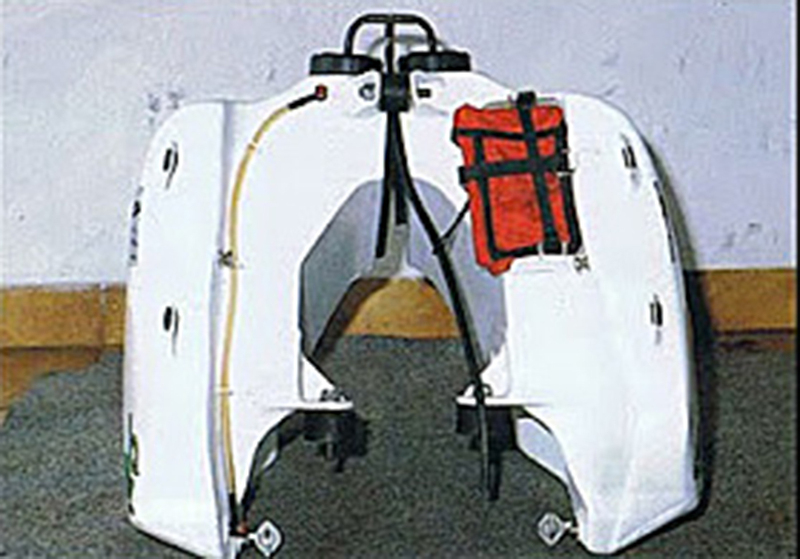 The rear locks the rear cradle and comes with two handles very useful in cover-ups. Within these enclosures was introduced a special foam to avoid violent rinses, otherwise dangerous in driving, and especially when cornering. 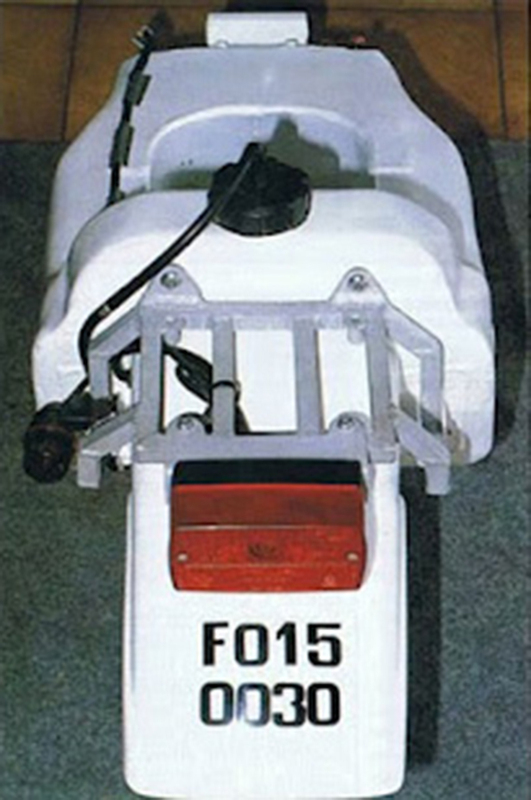 The water tank is placed under the engine (required for regulation) with its 6 Lt. about capacity, the battery compartment and a large closet for any spare parts and tools. 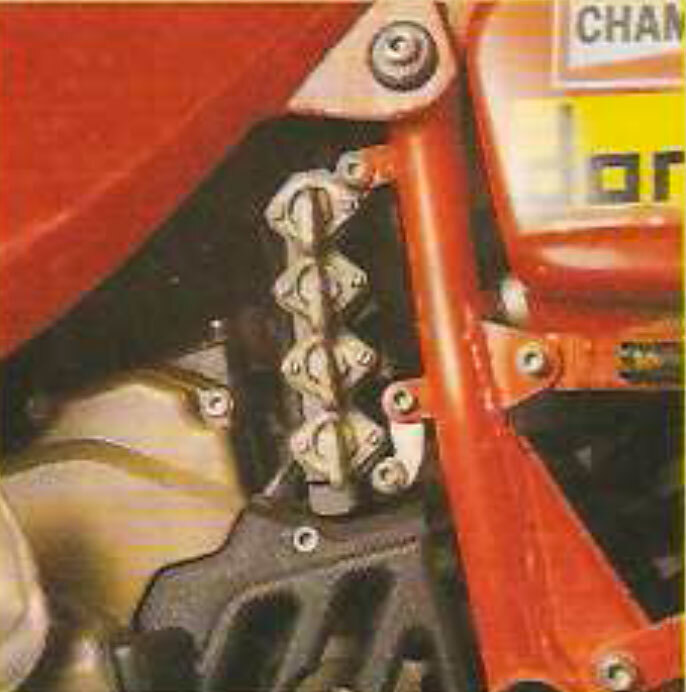 With the bottom plate, the latter also serves as a protective shield for the crankcase. Finally the windshield and the wings were made out of Wild Design Team even though it clearly inspired by those of the official Yamaha. In their design was curated especially repairability in case of accident. 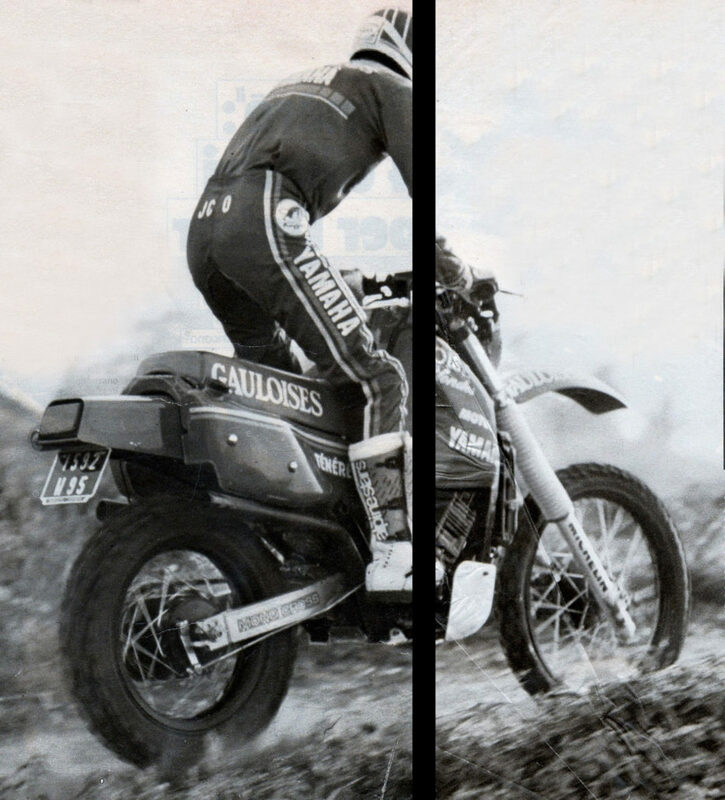 And we must recognize, After seeing Marcaccini at work, that all the trappings dismantled in minutes. 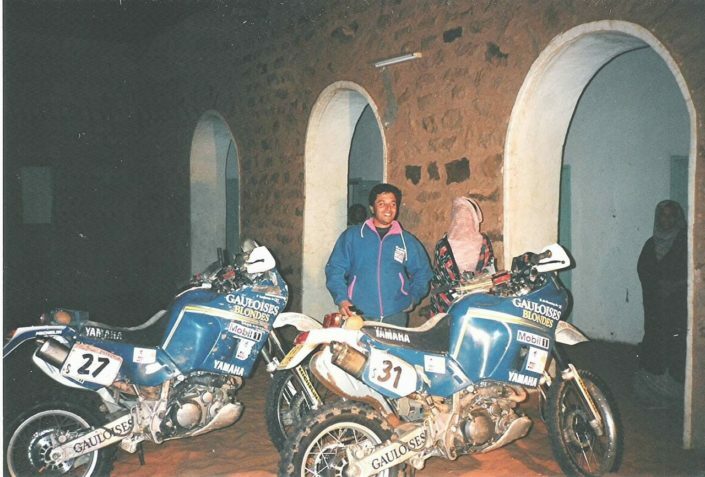 A great job then, especially considering the excellent overall result that did not fail to impress various representatives of foreign press and I same opponents. 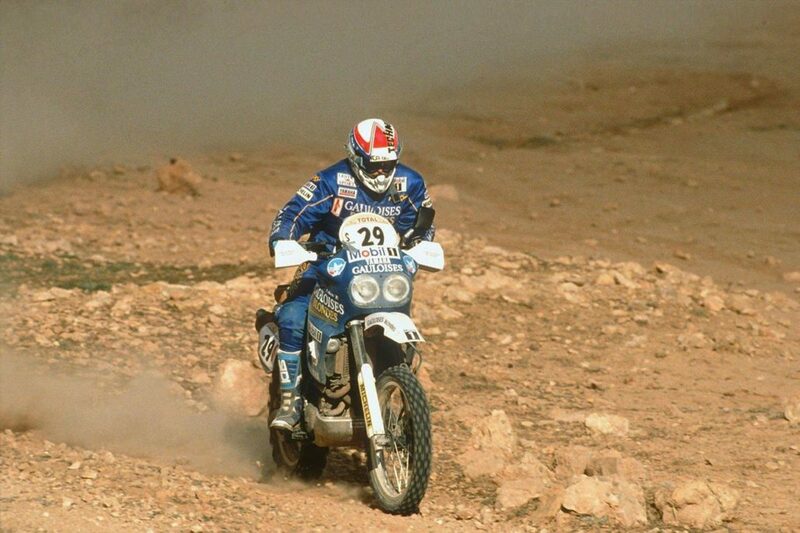 Ed: all 3 Yamaha's Wild Team reached the finish line in Dakar, Montebelli 17°, Abbasi 28° and 30° Marcaccini.